Happy 15th birthday to the euro but where will you be at 30? The European single currency now 15 years old on January the 1st. As the chimes of midnight struck on January 1st, 2002, almost 20,000 people gathered in the freezing cold close to the European Union institutions in Brussels to watch a spectacular fireworks display. They were celebrating the introduction of euro notes and coins in 12 European countries, an event many saw as a momentous step on the path towards Europe’s political integration. “The euro is a victory for Europe. After a century of being torn apart, of wars and tribulations, our continent is finally affirming its identity and power in peace, unity and stability,” French president Jacques Chirac declared. Fifteen years later, the EU has witnessed its first act of disintegration, with Britain’s vote in June to leave the organisation. And the euro, once heralded as a powerful binding agent for Europe’s nations, is now increasingly derided as corrosive to the principle of solidarity which underlies the European project. The single currency remains popular in the countries that use it, according to the latest Euro-barometer report, although it is viewed negatively outside the euro area. The euro is especially popular in Ireland, with support for the single currency at 85%, second only to Luxembourg. Support for the EU itself is in decline among Europeans, however, as is the number of EU citizens who say they are optimistic about the union’s future, down from 70% a decade ago to just half today. This lack of confidence is reflected in the withering of ambition within the European institutions, where few now expect significant further political integration. In Brussels, power has shifted from the European Commission to the European Council, where national leaders pursue an intergovernmental agenda. Much of this loss of confidence is the result of the multiple crises that have shaken the euro zone in recent years, with the erosion of solidarity in one policy area seeping into others, making a common approach to issues such as the migration crisis more difficult to achieve. There is a cruel irony here, as the euro was conceived by the previous generation of European leaders as a great political project as much as an economic one. When they started the process of economic and monetary union at Maastricht in 1991, it was partly in response to German unification the previous year. Like the Schengen Agreement, which abolished border controls between most EU states, the euro was seen as a practical manifestation of the usefulness of European integration. It was hoped that it could serve as an antidote to the remoteness of European institutions, while reassuring European citizens that they could take an important step towards sharing responsibility without losing their national identities. France’s masterplan went awry from the start, with Theo Waigel, Germany’s finance minister throughout most of the 1990s, summing up his country’s determination to put its stamp on the new currency with the words “Der Euro muss Deutsch sprechen” (“the euro must speak German”). The European Central Bank (ECB) was designed in the image of the Bundesbank, independent of political influence and with a narrow mandate focused on price stability. Other major central banks, such as the Federal Reserve in the US, must also take unemployment and economic growth into account when they make monetary policy decisions. The impression that the currency served the interests of the EU’s more powerful members was reinforced when the euro zone’s two biggest countries, Germany and France, became the first to flout its fiscal rules, and received only the gentlest reprimand from Brussels. But the low interest rates Germany needed to boost its economy in the early years of this century helped to fuel a massive construction boom in southern European countries and in Ireland, helping to overheat their economies. With few political tools to influence national policies, Brussels and Frankfurt could do little more than sit back and watch the gathering storm, issuing regular warnings which were universally ignored. But if the ECB’s monetary policy helped fuel the spending boom and the debt crisis which succeeded it, the one-size-fits-all austerity doctrine imposed by euro-zone governments in response to the crisis helped to alienate citizens from Brussels and from their own governments. Wielding the whip hand of the creditor, the Eurogroup of finance ministers has forced one government after another to bend the knee, obliging many to break the promises they had made to voters. The consequences of this approach can be seen in the erosion of the political centre throughout Europe, as a growing number of voters conclude that electing a new government will change little unless the entire system is upended. As the euro enters 2017, the currency has survived its various crises and confounded predictions that it would collapse or disintegrate. ECB president Mario Draghi’s creative approach to the rules has helped to keep the euro zone together and fewer than one in three euro-zone citizens would like to return to national currencies. But if the euro is likely to survive, its design flaws and the reckless policies pursued by the politicians charged with defending it continue to have serious repercussions for the EU itself and for public confidence in its institutions. Josaphine Feehily, chairperson of the Policing Authority. The Policing Authority will assume responsibility for the appointment of senior gardaí from tomorrow, taking over this function from the Government. All appointments to the rank of assistant Garda commissioner, chief superintendent and superintendent will be managed by the authority. Tánaiste and Minister for Justice Frances Fitzgerald said with the assumption of this responsibility on January 1st, the authority had, within 12 months of its formation, assumed all of its intended functions. The Policing Authority is an independent body which has been set up to provide oversight of the provision of policing in Ireland by the Garda Síochána. Ms Fitzgerald said the selection and appointment of candidates to senior Garda roles was “an onerous responsibility and I want to wish the authority every success with this very important work”. Also from tomorrow, inspectors and superintendents in both An Garda Síochána and the Police Service of Northern Ireland are eligible to apply for appointment to the assistant commissioner and chief superintendent ranks. Before Christmas the Cabinet filled senior Garda vacancies shortly after Garda commissioner Nóirín O’Sullivan warned “critical” roles within the force needed to be filled. Ms O’Sullivan had said eight of the 17 senior Garda officers currently listed for promotion must be appointed immediately to fill “critical” roles. As well as making the eight promotions requested by Ms O’Sullivan, Ms Fitzgerald said an additional three appointments were also approved by Cabinet. The appointments included one to the position of assistant commissioner, three chief superintendents, and seven superintendents. They will be made at national, divisional and district level. “The Government is determined that there is no undue delay filling critical Garda vacancies and is determined to ensure that An Garda Síochána has a leadership team that can address the serious challenges it faces every day in maintaining law and order,” Ms Fitzgerald said. Gardai say that as well as burglary, theft, particularly of mobile phones, is also vastly under-reported. 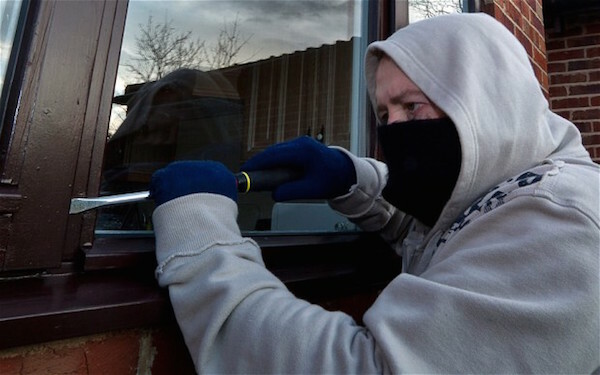 Just over 2,000 convictions resulted from the investigation of 27,653 ‘recorded’ burglaries in 2014, according to new data from the Central Statistics Office. The CSO has, for the first time, included court proceedings and outcomes with figures alongside the ‘recorded’ cases of burglary. The figures appear to uphold the long-held view of both gardai and victims of crime that there has been systematic manipulation of figures for years to suggest a higher ‘detection’ rate of crime such as burglary and theft. Gardai say that as well as burglary, theft, particularly of mobile phones, is also vastly under-reported. Most mobile phone thefts are still recorded as ‘lost property’ even though thousands of phones are stolen annually by organised crime gangs, often from outside the State. The change in the way the CSO records crime statistics came about in 2014 after an investigation by the independent watchdog body, the Garda Inspectorate, uncovered widespread manipulation of crime figures caused by the ‘recategorising’ of offences such as burglary to less serious offences or none at all. For decades, Ministers for Justice have annually congratulated the Garda for falls in crime figures and this year was no different. Just before Christmas, the Tanaiste and Minister for Justice and Equality, Frances Fitzgerald, congratulated the Garda for their “impressive results in their sustained drive against burglars”. She was referring to a drop of “31pc in the level of burglary crime, continuing the positive trend shown in CSO figures for the first half of 2016”. 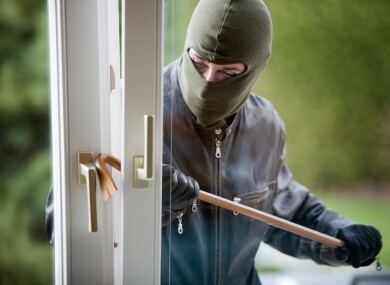 The Tanaiste said: “An Garda Siochana continue to achieve impressive results in their sustained drive against burglars under Operation Thor, which is powered by increased resources provided by the Government and supported by new legislation which I introduced this time last year, targeting repeat burglary offenders. The Government remains absolutely committed to supporting Garda efforts to combat crime including Operation Thor. It is encouraging that the regional breakdown of the CSO figures shows that Operation Thor is benefiting communities right across the country. However, the CSO has warned that figures supplied to it by the Garda after years of inaction over an agreed system for accurately recording crime alongside court outcomes may not be accurate. For the first time, the CSO has compiled figures from the Garda and the Courts Service. This resulted in the first record of the “number of crime incidents recorded, detected with relevant proceedings and court outcomes’ for 2014”, published in early December. This table shows 27,653 ‘recorded’ burglaries with another Garda figure of 4,883 burglaries detected and 3,369 in which ‘proceedings were commenced’. However, when the Garda figures are placed alongside the Courts Service records, it shows there were only 2,002 convictions, 672 acquittals and 620 appeals against conviction. This would suggest a conviction rate – rather than the ambiguous ‘detection’ rate – of 7pc or less. The CSO states on its website that it is incumbent upon all agencies, including the Garda and private industry, to accurately supply it with data. It is an offence to provide the CSO with false data. The figures cited by the minister show a ’31pc drop’ over 2015. This would mark the biggest annual decline in almost any crime category in the history of the force. Normally statistics supplied by the Garda show only small percentage changes. Activists in Sligo town have occupied an empty office building there. The building, which is believed to be owned by Nama, has been taken over by homeless activists in a similar way to the occupation of Apollo House in Dublin by Home Sweet Home activists recently. The building’s location is being kept secret for the time being, but there is said to be fewer than 10 homeless people present in the disused offices which have no water or electricity. However, the occupants do have mattresses and food and the conditions have been described as warm. It is being reported by the Journal.ie that the owners of the building have not taken any action yet to take it back from the occupiers. Breakingnews.ie have contacted the Gardaí and are awaiting confirmation from them about the occupation. 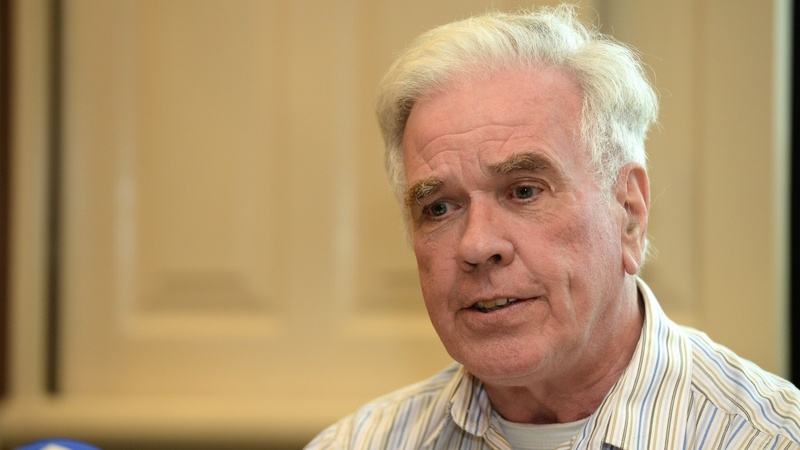 The Peter McVerry Trust says there needs to be a focus on long-term solutions for homelessness. Staff from the homeless charity will visit Apollo House in Dublin today where occupants have until January 11 to vacate the building. The Trust is opening up a further 25 beds in Ellis Quay tonight, where 70 people will be able to stay over Christmas, and into the summer. CEO Pat Doyle says the Home Sweet Home campaign is doing a great job at highlighting the issue, but he fears for the residents of Apollo House. Mr Doyle said: “I know our population of homeless people, I’ve worked with them all my life and we’ve worked with around 4,500 of them this year. “Some people who are homeless just need a house, but some people have other issues, complex issues, and so obviously, I would have concerns for their wellbeing. An established Stroke Research Group within the Clinical Health and Nutrition Centre (CHANCE) at IT Sligo is working on new ways to help patients recover from Stroke. 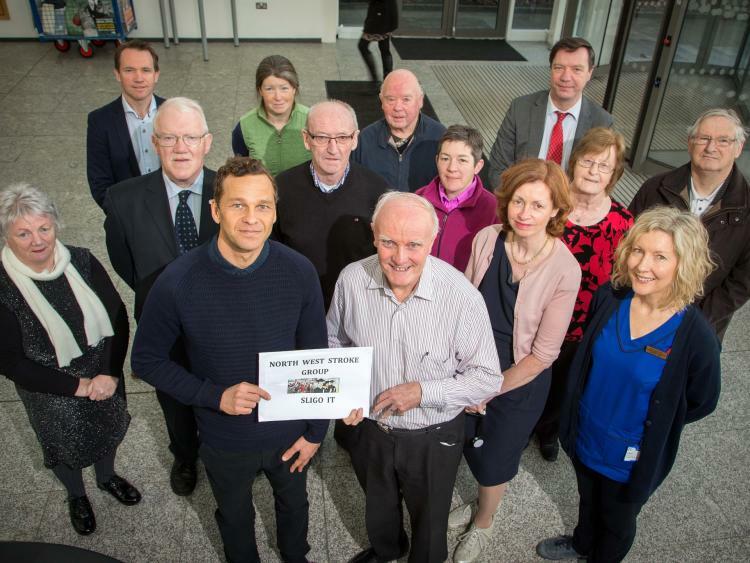 Daniel Simpson from the Stroke Research Group, which is headquartered in IT Sligo’s School of Science, is currently carrying out clinical trials into new and exciting rehabilitation treatments for home-based stroke patients. The PhD student, who is originally from Wales, has received a bursary worth €6000 from the North West Stroke Group Ltd towards continuing research into innovative rehabilitation techniques. The treatments will use simple mirrors and innovative strength training techniques, to allow stroke patients to carry out therapy with minimal assistance at home or in a therapy setting. The therapy is already showing huge potential. The stroke research group, is also carrying out home based clinical trials using a simple treadmill with mirrors, and has established a strong network with the Health Service Executive and the Stroke Unit in Sligo University Hospital, and their Consultant Geriatrician Dr Paula Hickey. ‘We know that there are over 30,000 people living in Ireland with disability due to stroke,” explains Dr Hickey. The stroke group also works closely with both University College Dublin (UCD), and Royal College of Surgeons Ireland (RCSI). With stroke patients allowed to carry out four-week innovative exercise programmes in their own home, in a tailored fashion, the clinical trials have been attracting increased interest in the North West stroke community. Laurence Cassells, Secretary for the North West Stroke Group describes the potential benefits of this research as exciting. “We are donating this money because we genuinely believe that there is huge potential to improve the lives of our members,” he says. 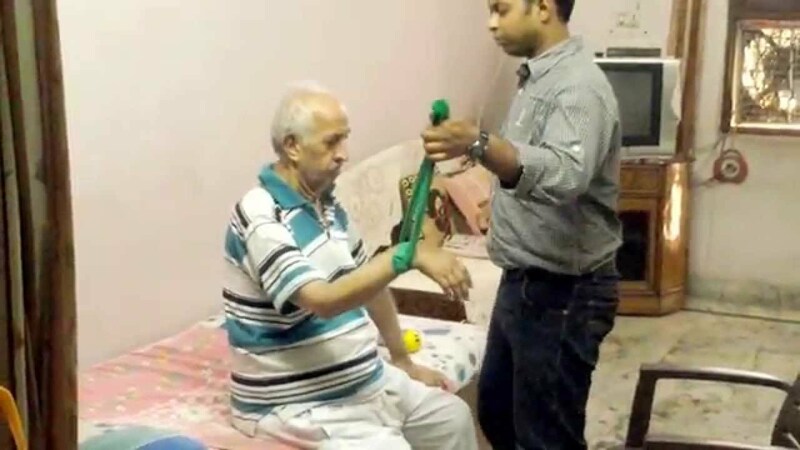 It is expected that these new innovative rehabilitation treatments will be used within rehabilitation settings, and also within the patient’s own home in the future. The Stroke Research Group, was founded by Dr Kenneth Monaghan, Mr Patrick Broderick, Mr Daniel Simpson, and Ms Monika Ehrensberger, in 2014. This Group is supported by IT Sligo and is currently looking for more stroke patients to participate in clinical trials in their own home. For more information or to volunteer for clinical trials, please contact Daniel Simpson on 087-0531507 or email Daniel.simpson@mail.itsligo.ie . The findings overturn a widely held scientific view that lengthy periods of warm and cold weather in the past might have been caused by periodic fluctuations in solar activity. Research examining the causes of climate change in the northern hemisphere over the past 1,000 years has shown that until the year 1800, the key driver of periodic changes in climate was volcanic eruptions. These tend to prevent sunlight reaching the Earth, causing cool, drier weather. Since 1900, greenhouse gases have been the primary cause of climate change. The findings show that periods of low sun activity should not be expected to have a large impact on temperatures on Earth, and are expected to improve scientists’ understanding and help climate forecasting. Scientists at the University of Edinburgh carried out the study using records of past temperatures constructed with data from tree rings and other historical sources. They compared this data record with computer-based models of past climate, featuring both significant and minor changes in the sun. They found that their model of weak changes in the sun gave the best correlation with temperature records, indicating that solar activity has had a minimal impact on temperature in the past millennium. The study, published in Nature GeoScience, was supported by the Natural Environment Research Council. “Until now, the influence of the sun on past climate has been poorly understood,” says Dr Andrew SchurerSchool of GeoSciences. “We hope that our new discoveries will help improve our understanding of how temperatures have changed over the past few centuries, and improve predictions for how they might develop in future. Links between the sun and anomalously cold winters in the UK are still being explored. The latest Irish tax returns showed strong growth in tax revenues, led by better than expected corporation tax. The latest Exchequer returns for November show the State is well on track to hit its deficit forecast for the year, but with signs Brexit and sterling may be starting to have an impact. VAT income in particular was coming in less strongly than expected. As has been the trend, the latest returns showed strong growth in tax revenues, led by better than expected corporation tax. Total revenues this year were now €777m higher than profile, or expectations. Spending was coming in €784m below profile. That leaves the Exchequer better off, with an excess of spending over income of €407m compared to €1.7bn last year. Exchequer Returns to the end of November showed more tax had been paid this year than at the same time in 2015 across all four of the main areas. As well as corporation tax coming in ahead, income tax ended November 5.9pc, or €978m, higher than at the same time last year. 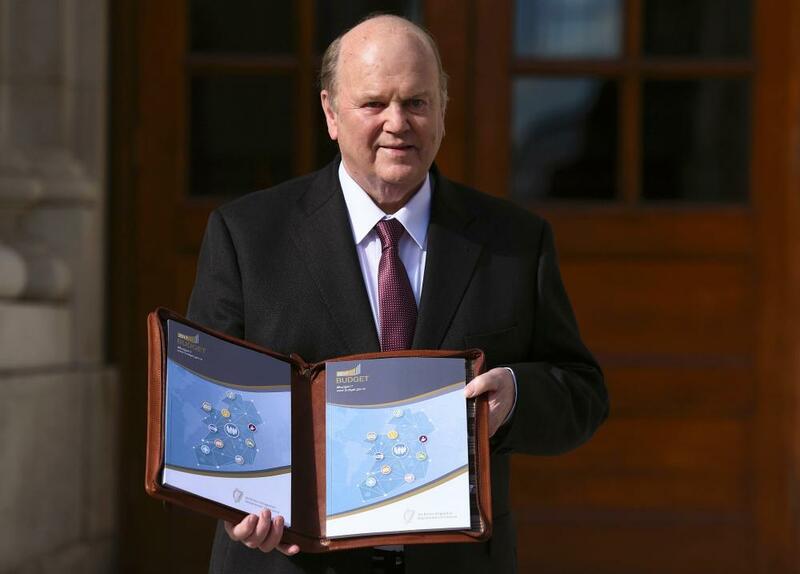 However, VAT receipts closed November 6.6pc or €128m behind expectations. The Department of Finance said that was mainly accounted for by larger than expected repayments. VAT receipts were now €413m below profile for the year to date, though in absolute terms up from last year. Excise duties recorded an expected shortfall of €24m in November, but were running just ahead of profile for the year. “The trend in VAT receipts is a little concerning: these were 6.6pc behind profile in November, the final ‘due’ month of the year. VAT receipts are now €413m (-3.2pc) behind profile year-to-date, which might reflect the softer retail sales data in recent months,” David McNamara of Davy Stockbrokers said. Cyril Roux, deputy governor & the Governor Philip Lane of the Central Bank of Ireland . 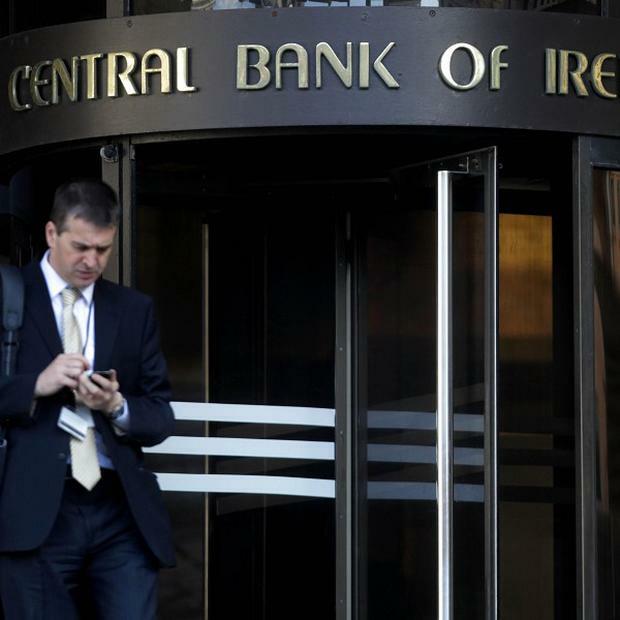 The Republic of Ireland’s Central Bank has not tried to turn any UK banks or firms off setting up in Ireland in the wake of the Brexit vote, its deputy head said yesterday. Cyril Roux, the deputy governor of the Central Bank, insisted that the regulator had not discouraged investment banking or trading in Dublin, contrary to recent reports. The statement contradicts claims that Irish authorities had discouraged UK companies from relocating in the Irish Republic after Brexit because of regulatory concerns about how they would be policed. But Mr Roux was adamant this was not the case. “I want to be clear… we do not have such a position,” he said. However, he reiterated that the Republic’s Central Bank would only allow new businesses into Ireland that have a “substantive presence” in the country. Mr Roux said the bank was not concerned about the arrival of major firms, but that smaller financial institutions may attempt to use Ireland as a convenient base within Europe, while the companies retain their real operations in the UK. “The flagship firms are not a problem,” he added. 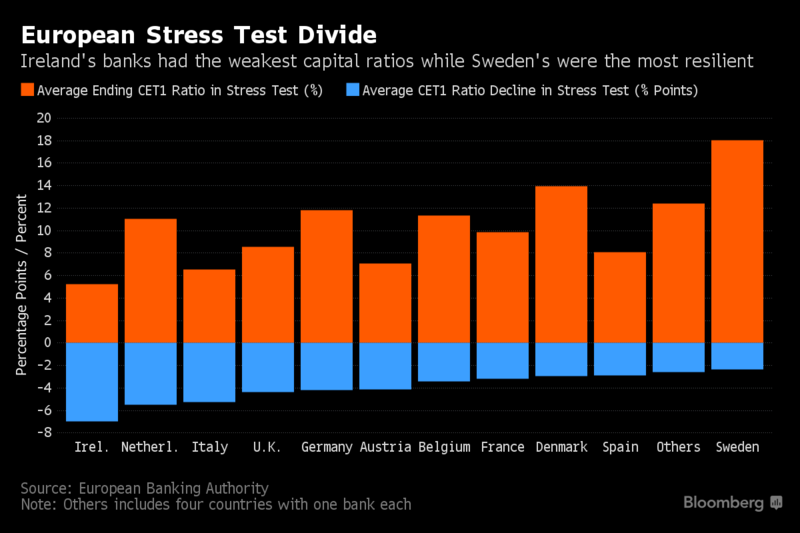 “They don’t expect to bring a big balance sheet here and have a handful of people. “There are some other firms of a different nature who believe you can just come here and nail a brass plate and rent a room and keep on doing everything from the UK. We have to tell them it’s not going to happen. “The Irish financial sector is set to grow, and quite possible to a significant extent. The CEO of AIB Bernard Byrne (above left) said the bank’s NPL ratio was about 17.5%. 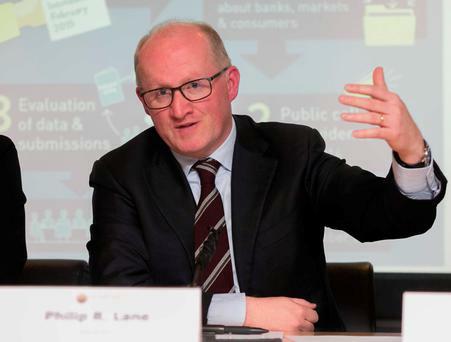 Ireland has ranked fifth among European states in terms of the ratio of non-performing loans (NPLs) held by its banks, according to a report by the European Banking Authority in London. The analysis shows Ireland with an NPL ratio of just more than 20%, ranking fifth behind Cyprus, Greece, Portugal and Slovenia. Across the board, the rate was 5.4% with Luxembourg the best in class with a figure of about 1.5%. In Ireland, the ratio was worst for the SME sector at 30%, with large corporates at about 13% and households at 15%. Ireland’s poor performance is clearly a factor of the crash of both the economy and property market from late 2008 onwards. The concentration of NPLs was one of the reasons why AIB and Bank of Ireland fared so badly in recent bank stress tests under the adverse scenario, in spite of both being back in profit and generating capital. The EBA said that while there are signs of potential improvements across Europe in terms of dealing with NPLs, asset quality is still weak compared to historical figures and other regions. In its report, the EBA said action on NPLs was needed, including supervisory actions, structural reforms and development of secondary markets. AIB chief executive Bernard Byrne told the Oireachtas finance committee last week that NPLs were a major focus of its regulators at the European Central Bank in Frankfurt. He said AIB’s ratio was about 17.5%. The EBA also found that cyber attacks were on the rise and that banks are “struggling to demonstrate their ability to cope”. “In this context, supervisory are focusing on IT-related risks including measures to fix rigid and outdated legacy IT systems, IT resilience, and governance and outsourcing,” it said. Worst November figures on record? 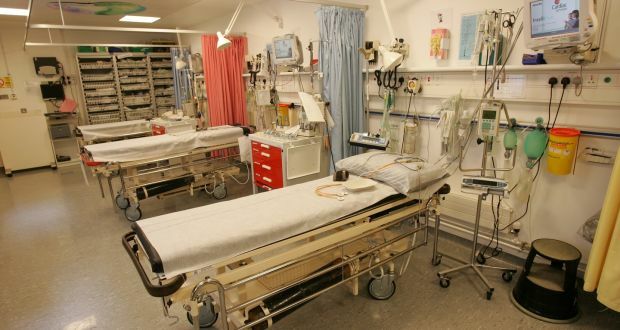 Over 9,300 patients were left waiting on Ireland’s hospital trolleys last month? 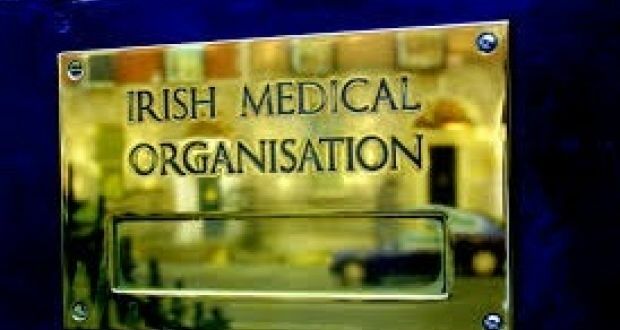 The worst November figures ever recorded, the Irish Nurses and Midwives Organisation (INMO) has said. Last month’s figures represent a staggering 99% increase when compared to November 2006, when 4,671 people were left waiting on trolleys. It is also a jump of 26% when compared to the same period last year, when 7,407 people were left on trolleys. 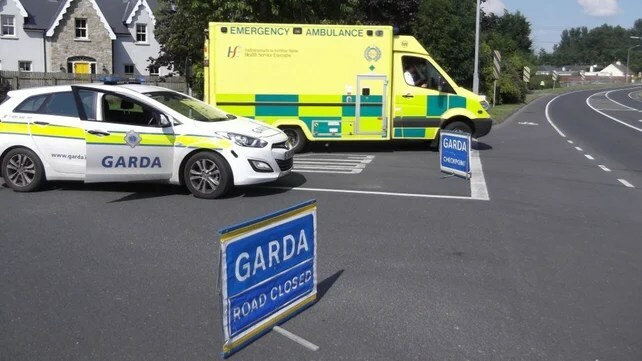 The worst affected hospitals last month included University Hospital Limerick (789), South Tipperary General Hospital (680), Cork University Hospital (648), Our Lady of Lourdes Hospital in Drogheda (607) and University Hospital Galway (594). However, the news was not all bad. The overall trolley figures from January to November 2016, show a small reduction of 1% when compared to the same period last year. This is the first year a reduction during this period has been recorded since 2006. Altogether, 85,731 patients were left waiting on trolleys in the first 11 months of this year, compared to 86,864 during the same period last year. The waiting figures in the east reduced by 21%, with Connolly Hospital in Blanchardstown recording a 48% fall in its trolley waiting figures. However, many hospitals outside of Dublin recorded an increase, with the biggest jump – 162% – recorded in South Tipperary General Hospital. The INMO said that overall, these figures are ‘very disappointing’, as they confirm that all of the measures taken to date to tackle this issue have failed to work. “These figures are hugely disappointing, if not surprising, and confirm yet again that our health service cannot cope with the demands being placed upon it. The figures for November are particularly alarming as we enter the peak winter period, with the inevitable increased demand that takes place every year over the next three to four months,” commented INMO general secretary, Liam Doran. 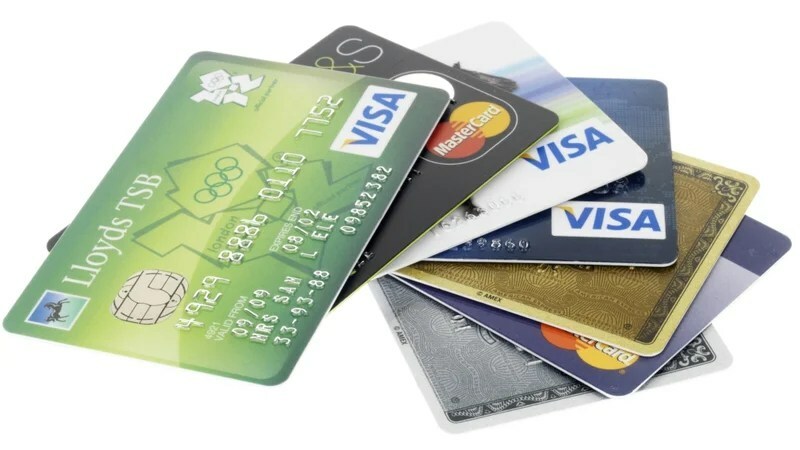 Gardaí are warning retailers to be especially vigilant after a Dublin based gang used false credit cards at a number of stores in Letterkenny. Crime Prevention Officer Sgt Paul Wallace told the Democrat today that the gang made off with thousands of euros worth of high end goods and cash in the scam yesterday evening. 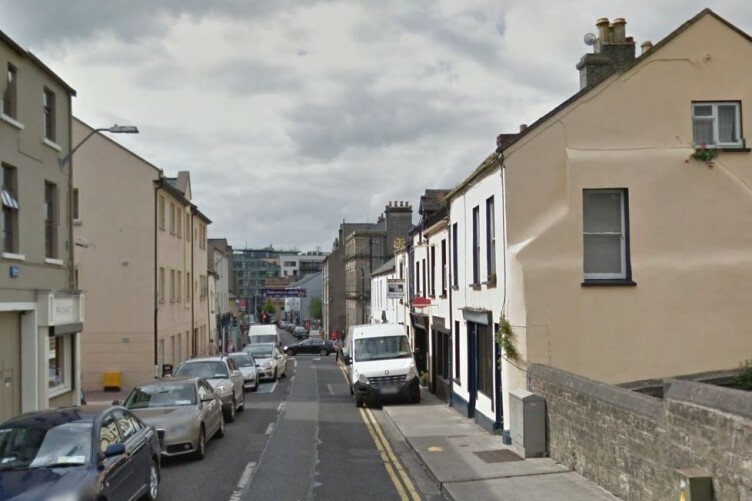 “They used false credit cards to buy high value goods such as phones, laptops, tablets, designer watches and fragrances at a number of shops in Letterkenny on Friday evening. Another tactic they used was to ask for cashback,” he said. Sgt Wallace appealed to shop owners to take a few minutes at the start of the day to ensure all their staff are familiar with the security protocols. “The criminals are aware that many towns and villages are in the midst of their Christmas promotions. Shops are busy and there are a lot of inexperienced, seasonal staff doing their best. “Taking ten minutes at the start of the day to go through all the security protocols can save a lot of anguish,” he advised. Owners and staff are also advised to be extra wary if a customer they don’t know immediately asks to see the most expensive range of goods on offer, especially something that could be sold on very easily, or looks for a lot of cash back in addition to their card transactions. In addition, Sgt Wallace warned that false notes, especially €50 and €20 notes, are in circulation. Again, he said, there are some simple safety measures that can prevent a business being caught out. “Go to the Central Bank website for guidelines on how to tell the difference between real notes and counterfeits, and ensure that your staff are familiar with these. “We also recommend using a security light for cards and notes, as that’s the best way to reveal whether important security features are missing. We are living through the most dangerous time in the history of the human race, according to Professor Stephen Hawking. The Cambridge University physics professor named overpopulation, climate change and diseases as just some of the threats facing our planet. He said we have developed technology that could destroy Earth, and we must ‘retrain’ for a new world where robots have replaced many everyday jobs. Writing in a comment article in The Guardian, Professor Hawking explained what worries him about the future of our planet. ‘For me, the really concerning aspect of this is that now, more than at any time in our history, our species needs to work together,’ he said. ‘We face awesome environmental challenges: climate change, food production, overpopulation, the decimation of other species, epidemic disease, acidification of the oceans. 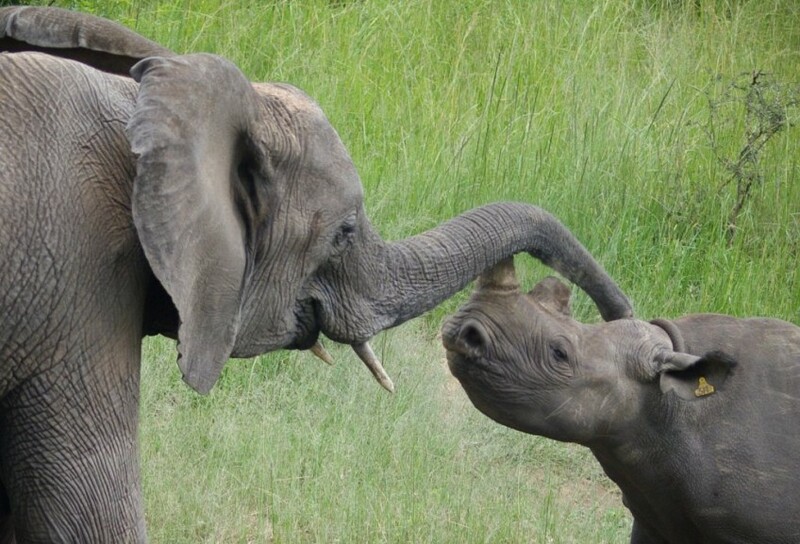 ‘Together, they are a reminder that we are at the most dangerous moment in the development of humanity. In September the physicist warned our planet is becoming a dangerous place because of the threat of war or disease. Our desire to create helpful digital assistants and self-driving vehicles could bring about our demise. Professor Stephen Hawking warned that humanity faces an uncertain future as technology learns to think for itself and adapt to its environment. But Professor Hawking noted other potential benefits of this technology could also be significant, with the potential to eradicate, war, disease and poverty. ‘Looking further ahead, there are no fundamental limits to what can be achieved,’ continued Professor Hawking. 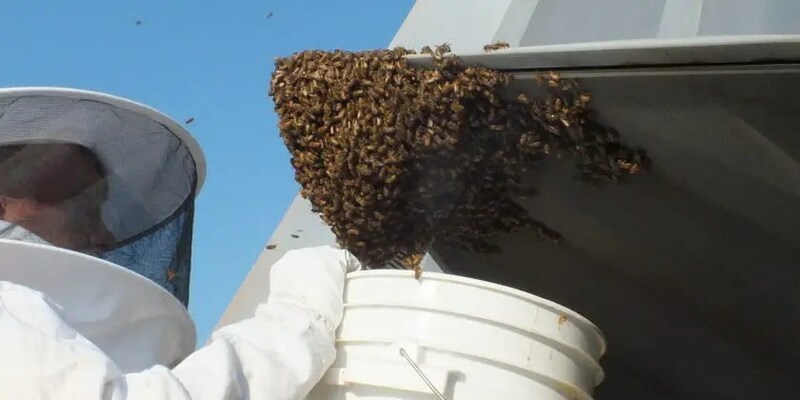 ‘I believe that life on Earth is at an ever-increasing risk of being wiped out by a disaster, such as a sudden nuclear war, a genetically engineered virus, or other dangers,’ he said. Professor Hawking made similar comments earlier this year while recording the BBC’s annual Reith Lectures on January 7. The lecture explored research into black holes, and his warning was made during questions fielded by audience members. When asked how the world will end, Hawking said that increasingly, most of the threats humanity faces come from progress in technology. The scientist, who turned 74 this year, said the threats include nuclear war, catastrophic global warming and genetically engineered viruses. ‘We are not going to stop making progress, or reverse it, so we must recognise the dangers and control them,’ he said, speaking to Radio Times ahead of the lecture. To get away from these threats, humankind will have to colonise other planets, which Hawking believes will take more than a century. 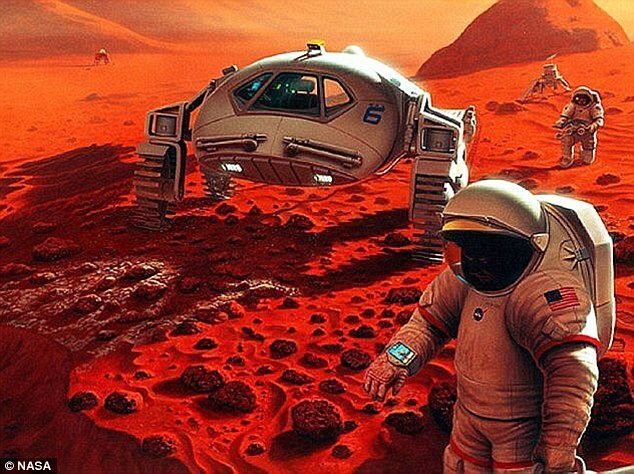 ‘We will not establish self-sustaining colonies in space for at least the next hundred years, so we have to be very careful in this period,’ Hawking said. ‘The probable life span of human civilization is much greater if we’re a multi-planet species as opposed to a single-planet species,’ Elon Musk said last year. ‘If we’re a single planet species, then eventually there will be some extinction event,’ Mr Musk said. His company SpaceX is working to send humans to space. Last week the firm test fired one of its new Raptor ‘interplanetary transport engines’ which the company will use to carry astronauts to Mars. The rocket engine is three times more powerful than the one on the Falcon 9 rockets. It will ultimately be used to launch SpaceX’s manned spacecraft off our planet. Mr Musk, chief executive of SpaceX, said the rocket will be ultimately capable of producing thrust of 690,000lbs over 382 seconds. The engine is powered using liquid methane and liquid oxygen rather than the kerosene used in the Merlin engines of its Falcon 9 rockets. 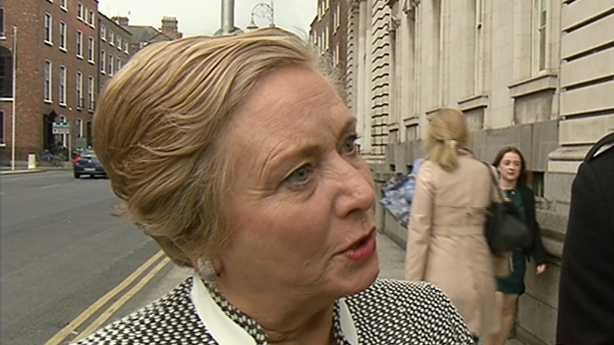 The Minister for Justice Frances Fitzgerald: says enhancing rural access to the Garda network by connecting non-networked sites to the network is being examined. Many Garda stations are not connected to the Garda Pulse network, according to Department of Justice figures. 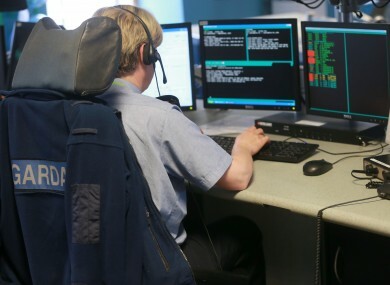 Minister for Justice Frances Fitzgerald said 167 stations were not connected to the Garda computer network, but that Gardaí can “contact the Garda Information Services Centre to provide relevant details to trained civilian call-takers who enter the details on the Pulse system”. Enhancing rural access to the Garda network by connecting non-networked sites to the network was being examined, she said. Sinn Féin justice spokesman Jonathan O’Brien, who sought the information in a parliamentary question, said Garda management “want to close as many stations as possible”. Gardaí in non-Pulse connected stations report into a centralised centre in Connacht. The Garda Inspectorate and the Garda Commissioner favoured a regional model, he said. Mr O’Brien, who was appointed justice spokesman after this year’s general election, said “it’s not politically popular but international best practice has shown and the Garda Inspectorate has said that we have too many Garda stations for an effective policing service”. This conflicts with Sinn Féin’s 2016 election manifesto, which says “we will reverse the closure of Garda stations – these closures have provided minimal savings to the State of €556,000 per annum and are a shameful legacy of this government”. However, the Cork North-Central TD said the Garda Inspectorate view was that “to have an effective police service in the 21st century, you’re going to have some stations that are going to have to close”. Mr O’Brien pointed to the inspectorate’s call for a civilianisation programme of elements of the service, which he said “could release 1,500 Gardaí for active duty in a matter of months”, while the force would be recruiting 600 to 700. Gardaí should not be at the front desk in a station to deal with passport applications, he said. That was a job for civilians. He said Gardaí on duty reporting and investigating crimes should not actually be designating what category of crime is involved, in part because of excessive paperwork and also for improving crime classification. Mr O’Brien said a “Garda in Cork might designate a crime as burglary while another garda elsewhere might report it as trespassing even though it’s the same type of offence”. The Minister pointed to the launch in June of the Garda Síochána Modernisation and Renewal Programme 2016-2021 which aimed to “professionalise, modernise and renew An Garda Síochána” to meet current and future challenges. 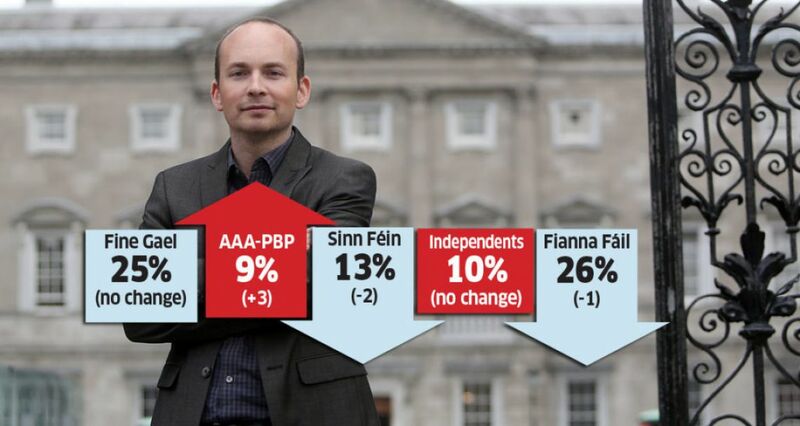 The Anti-Austerity Alliance and People Before Profit party has seen its support surge to its highest level in the latest Sunday Business Post/Red C poll. It is up by three points to a record 9% after extensive coverage of its attempt to pass an abortion referendum bill in the Dáil this week. The bill was defeated but party TDs such as Brid Smith, Ruth Coppinger, Paul Murphy and Richard Boyd Barrett all featured prominently in the debate. The poll of 1,000 voters, which was carried out between Monday and Thursday last week, is also the first to show the impact of the Budget on party support. Fianna Fáil, which played a key role in budget negotiations, has actually dropped in support by one point to 26%. It has now lost support in the last four Red C polls in a row. However, it still remains the most popular party among those polled. Fine Gael did not make any gains from the budget two weeks ago with its support unchanged at 25%. But the Independent Alliance is up by two points to 6%. Support for other Independents, which includes the likes of Children’s Minister Katherine Zappone, Communications Minister Denis Naughten and Independent TDs in opposition, is unchanged at 10%. While the AAA-PBP party has made gains, they appear to be at the expense of Sinn Féin, which is down by two points to 13%, and Labour, which drops by two points to 5%. The Green Party is up by one point to 3%, while the Social Democrats are down by one to 3%. For a full breakdown and analysis see below. Green Party 3 (+1) Totals 100. 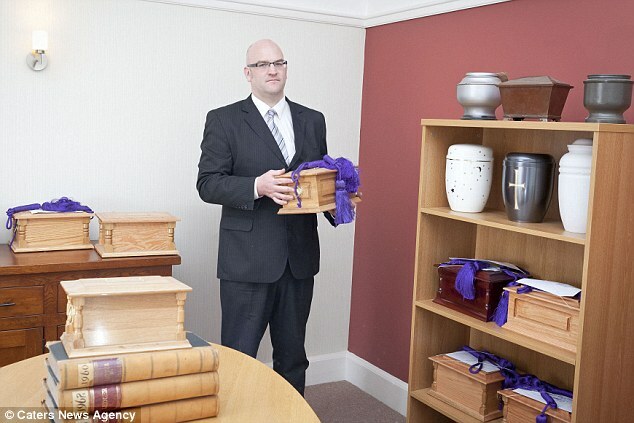 What do families who have already scattered the ashes of loved ones do now? What are we going to do now? the families of the faithful who have already scattered our loved ones’ ashes? 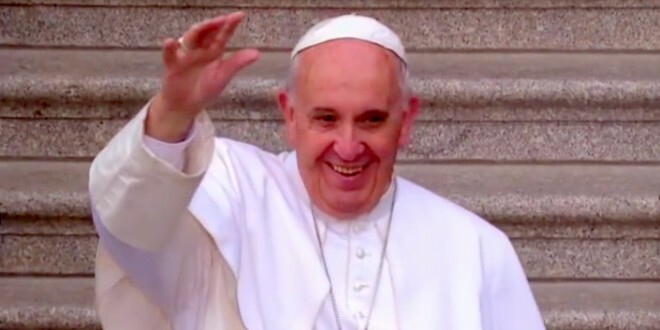 Can we assume that the new Vatican ban on the practice won’t be applied retrospectively? Can we also ask if the Catholic Church is bent on alienating us, the relatives of the 1,300 people cremated in Ireland annually? About 50% of all people who die in Ireland are cremated and, of those, about a quarter choose to bring the ashes home, or to scatter them. Not all of those people are practising Catholics and many may simply choose to ignore the new guidelines issued by the Congregation for the Doctrine of the Faith and approved by Pope Francis. But for the observant, it is now against Church regulations to scatter the ashes of our departed relatives in the air, on land, at sea, or in some other way. The measure is designed to counter so-called New Age ideas that death is a “fusion” with Mother Nature, or the “definitive liberation” from the prison of the body. The new rules also consider it non-Christian to preserve ashes or bone fragments “in mementos, pieces of jewellery or other objects”. That last instruction is, let’s say, interesting when you consider the bone fragments of saints that have, for centuries, been preserved “in mementos, pieces of jewellery or other objects” in lavishly made Church- approved reliquaries. You can visit them in the treasury houses of the bigger Catholic churches and cathedrals all around the world. I love visiting those wonderful repositories, packed, as they are, with rings, chasubles, copes, beautifully illuminated books, crosses, crucifixes and breath-taking reliquaries. They offer a tantalising peep into the past. They also show the deep human need for ritual in life but, more importantly, in death. Of course, the key difference between the Church’s collection of mementos and those held by its grieving faithful is that the former are held in a sacred place. That is one of the central concerns behind the latest Vatican document — it insists that ashes should be kept only in sacred places, such as cemeteries. In truth, the Catholic Church never fully endorsed cremation. It reluctantly allowed it as recently as 1963, so it is not entirely surprising to hear the Church say now that burial is the most “fitting way to express faith”. I won’t be alone in feeling a deep sense of betrayal in that understandable U-turn. I say “understandable” because this measure is all about exercising more control and we have come to expect that from the Catholic hierarchy. Though, it has to be said the softening of the rules on eulogies at funerals some years ago was a heartening step. In fact, only last week, at the funeral of a dear friend’s mother it struck me that Catholic funerals were one of the few truly inclusive Church occasions. There is something genuinely comforting about allowing family members stand on the altar to recall their loved ones in those moving self-penned prayers and eulogies that are often delivered in quavering voices. It is to the credit of Irish clergy that they allow a little of the profane to be included at the edges of their sacred rites. Allowing those family tributes has neither diluted the funeral liturgy, as was feared, nor turned religious ceremonies into some sort of a This is Your Life show. If anything, it has heightened the integrity of the sacrament and made it more meaningful to relatives and friends. Thanks, too, to those understanding priests who bend the rules on hymns and music. My wonderful Auntie Mary went out to the strains of the Preservation Hall Jazz Band, a nod to her love of jazz and her visit to New Orleans. But now? What about those committed Catholics who have passed on believing that the ashes of their living spouses would be scattered as theirs were, in some favoured beauty spot? Or those deeply Christian people, now departed, who would be rocked to their core to discover that they had contravened some Church regulation? Of course, they could not possibly know that the Church would move the goal posts, yet it is still not clear if the guidelines are retroactive or not. Worse, there is no explicit instruction on what Catholics should do if they scattered their loved ones’ ashes in a practice now deemed improper. In the ten years since we, as a family, scattered my father’s ashes, it comforts me to think that he got the dignified funeral that he had wished for. He was a committed Catholic but more than that, he was a truly Christian man in the broadest possible sense. One of the balms during his illness were the regular visits from local priests. They, too, were Christian in the broadest sense — those kind, generous, men helped us navigate some sort of a path through those final bewildering months. There were lots of bewildering moments in death, too. I remember calling to Glasnevin Cemetery to pick up the urn containing my beloved father’s ashes and wondering what to do with it; I couldn’t, in all conscience, put him in the boot, so I strapped him into the back seat as we drove to our native Kerry. I am almost afraid now to say exactly how we dispensed with those ashes, but I can say that, to us, it was sacred and fitting and solemn. The Catholic hierarchy has already alienated so many with its indifference to the child abuse scandals and its continuing refusal to include women, to mention the most damaging examples. Many, however, are still happy to dance around the fringes and join in during those important times in a Catholic’s life — baptism, Communion, Confirmation, marriage and death. But for how long? The Catholic Church is not a democracy, of course. Still, I can’t help feeling these new guidelines will prompt even more people to vote with their feet. People in Ireland consume three times more calories per day than those living in India and we are among the biggest consumers of calories in the world, according to a report. The average daily consumption of calories in the world is 1,398, with the lowest seen in India at 761 calories per capita per day. The highest is Belgium with 2,580 per capita per day. The Irish national average is at No 12 on a table of 54 countries with 2,307 daily calories per day. Data analysts, Euromonitor International, reveal that Ireland’s love affair with red meat and baked goods has bumped up calorie intake. Nutrition analyst at Euromonitor International, Sara Petersson, said the nation’s carbohydrate-heavy diet accounts for Ireland’s high calorie score. “Most of Ireland’s calories derive from meat, followed by baked goods, with bread being the primary source within that category. “In third place is dairy, and confectionery in fourth. This pattern is similar to what we see in other Western Countries such as the UK, the US or Canada. The Irish are the biggest carnivores in Europe with the nation tucking into nearly three times as many red meat dinners as our counterparts in Britain. 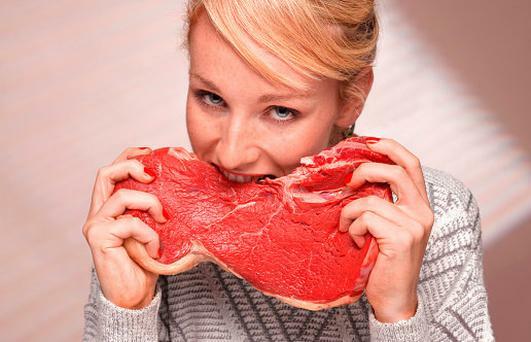 Irish people ate the equivalent of more than 70 steaks or 140 quarter pounders per head of population last year to become the top beef and veal eaters in Europe just ahead of the Netherlands and Denmark. Ms Petersson said the passport nutrition data relating to Ireland also shows the country consumes a high number of liquid calories. Our overweight and obesity prevalence has risen steadily over the past couple of decades from around 43% of the population in 1996 to 51% of the population in 2015, according to Euromonitor Data. In terms of just obesity, according to Euromonitor, Ireland was number 53 among 80 researched countries in 1996 and is currently ranked 59 in 2015. America had the highest rate of obesity followed by Kuwait and Venezuela. While 43% of the US population is classed as obese, the figures showed that 14.5% of the Irish population was obese in 2015. Euromonitor Table of Calories Per Capita for last year 2015. Some quality Pub eating houses west of the Shannon above. If you have built up an appetite as well as a thirst, 32 Irish pubs across 15 counties can provide the solution. The hostelries north and south of the Border have been named in the prestigious 2017 ‘Michelin Eating Out In Pubs Guide’. Of the 32 establishments listed, 25 are in the Republic and seven are in the North. And if you’re in Dublin, the two winners are only about 100 metres apart. Down dominates the winners with six listings, followed closely by Cork with five, Clare with four and Kildare with three. Galway, Dublin and Mayo each received two listings, while Antrim, Kerry, Leitrim, Louth, Sligo, Tipperary, Wexford and Wicklow all have one. The capital’s listings are the Old Spot and the Chop House, both located in Ballsbridge, Dublin 4. General manager of the Old Spot, Conor Kavanagh, spoke about what it takes to be listed in the guide for the second year in a row. “We opened at the end of 2014, so we’re really delighted about this,” he said. “We have a real dedication to quality and because we declared ourselves as a gastropub when we opened. I think people wanted to come and see us to check us out. Antrim’s listing is Billy Andy’s in Mounthill, near Larne. 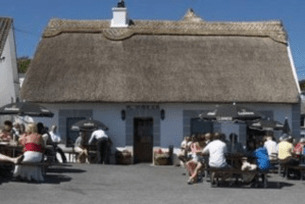 Clare’s pubs are Morrissey’s in Doonbeg, Vaughan’s Anchor Inn in Liscannor, the Wild Honey Inn in Lisdoonvarna and Linnane’s Lobster Bar in New Quay. Cork’s listed pubs are Mary Ann’s in Castletownshend, the Poacher’s Inn in Bandon, Deasy’s in Clonakilty, Cronin’s in Crosshaven and Toddies at The Bulman in Kinsale. Down’s winning pubs were the Pheasant in Annahilt, the Poacher’s Pocket in Comber, the Parson’s Nose and the Plough Inn, both in Hillsborough, Pier 36 in Donaghadee and Balloo House in Killinchy. Galway’s listings were Moran’s Oyster Cottage in Kilcolgan and O’Dowd’s in Roundstone. Kerry’s listed pub is the O’Neill’s Seafood Bar in Caherciveen. Kildare impressed with Hartes in Kildare town, the Ballymore Inn in Ballymore Eustace and Fallons in Kilcullen. Leitrim’s stand-out pub is the Oarsman in Carrick-on-Shannon, while Co Louth’s is Fitzpatrick’s in Jenkinstown. Mayo’s listings are The Tavern in Murrisk and the Sheebeen in Westport. Sligo’s top gastropub is Hargadon in Sligo town, while Larkins in Garrykennedy is the premier pub in Tipperary. Wexford’s listing is the Lobster Pot in Carne, while Wicklow won with Byrne & Woods in Roundwood. Wild Honey Inn and Toddies at The Bulman both retained an ‘Inspectors’ Favourites’ commendation, described as “establishments found to be particularly charming and which offer something extra special”. Scans from the fossil (pictured above right) revealed the brain tissue had distinct similarities to those of modern-day crocodiles and birds. We’ve long known that dinosaurs existed, mainly because of their fossilized skeletons. However, we’ve never seen a brain until just recently. Scientists have come across several dinosaur fossils in the past, but never have they seen a fossilized dinosaur brain. 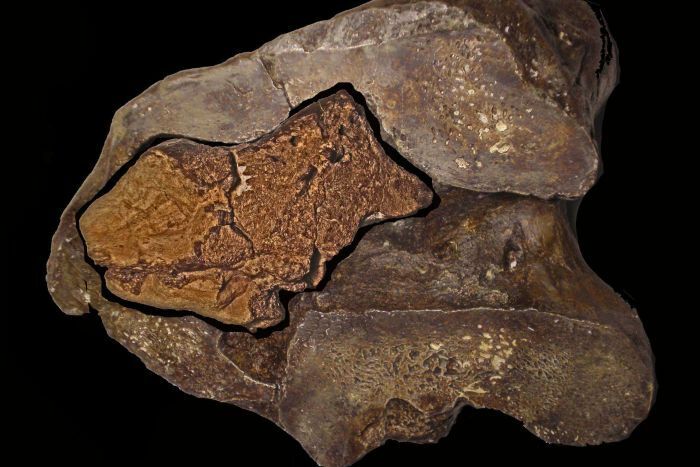 Well, this is no longer the case for the first fossilized brain tissue has been found in southeast England. The small clump of the rock-looking object most likely comes from a dinosaur that lived 133 million years ago. 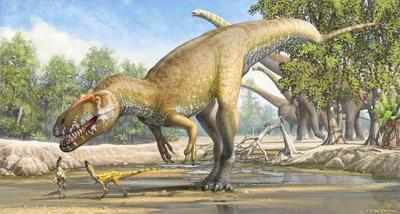 According to scientists, what they have found is a small brain tissue of a leaf-eating dinosaur, a large one at that. Researchers are not 100 percent confident of the type, but it could be similar to an Iguanodon. 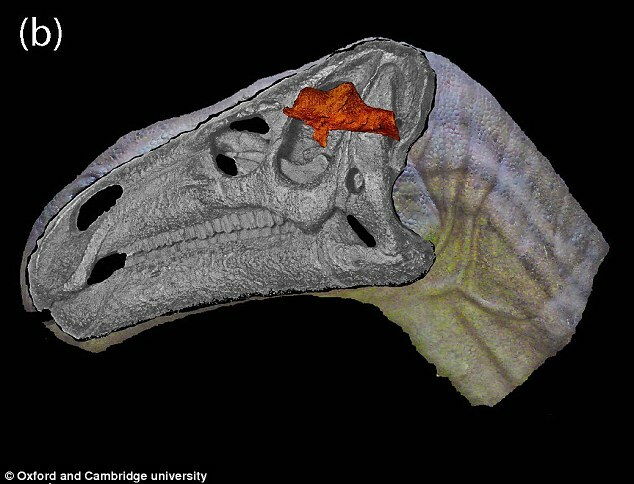 According to a report released by the Geological Society of London, the specimen is the first brain tissue found for a dinosaur, so there is a chance of finding more, but those chances are rather slim. Furthermore, scientists say the fossilized brain tissue has similar characteristics to that of crocodiles and birds. Here’s the thing, these findings could potentially shed light on how dinosaur brains and the brains of other ancient creatures have evolved over millions of years. This has always been a problem for researchers, but things could change for the better. 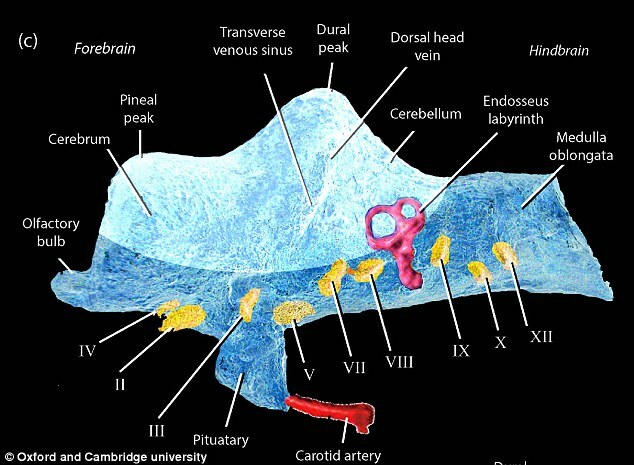 One of the reasons why scientists haven’t come across dinosaur brain tissue in the past is the fact that brains are the first part of a body to decay. It’s quite surprising this clump of brain tissue has been found, considering the circumstances. More Findings On The Horizon? This finding should allow scientists to have an idea of what to look for when seeking out fossilized dinosaur brains. They know where to look now, so it’s only a matter of time, no matter how long, before another clump of brain is located. How Smart Were The Dinosaurs? Where the brain fossil was located in the skull should give scientists an idea of how intelligent the ancient creatures were. However, they are hesitant at coming to any conclusion based on a single fossil. We’re guessing if more fossils are found in the future, researchers will make an announcement. Don’t be too surprised if these creatures were as smart as a crocodile. That would be scary, right? Recently, we reported the discovery of a new species of plant-eating dinosaur in Australia. This is the first to ever be discovered in the country, and we’re sure it won’t be the last. We understand the creature is a long-neck Sauropod, and spans nearly half the length of a basketball court. 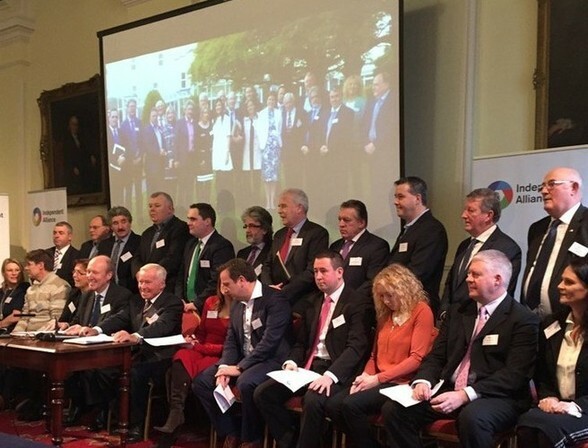 Taoiseach Enda Kenny said an all-island civic group would meet next month to discuss Brexit after the Cabinet agreed to set up an “all-island Civic Dialogue on Brexit”, with the first meeting in Dublin on November 2nd. It will be hosted by the Taoiseach and the Minister for Foreign Affairs and Trade and a broad range of “civic society groups, trade unions, business groups and non-governmental organisations as well as representatives of the main political parties on the island” will be invited , according to a Government statement issued on Tuesday. The Cabinet also agreed to intensify a series of initiatives to prepare for the British exit, after the Taoiseach brought a memorandum to Tuesday morning’s meeting. These include a series of discussions with interested groups in particular sectors, such as agriculture, education, etc, and measures to “Brexit-proof” next week’s budget. The Government also reiterated its intention to continue its programme of intensive diplomatic engagement with EU institutions and other EU member states. The European Commission’s chief Brexit negotiator, Michel Barnier, is expected to visit Dublin shortly. 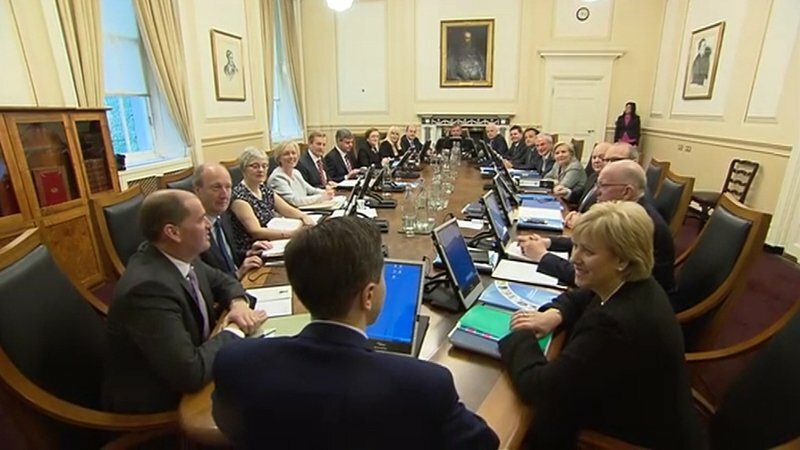 The decision to go ahead with the all-island dialogue flies in the face of thepublic rejection of the idea by the Northern Ireland First Minister Arlene Foster at a meeting of the North South Ministerial Council during the summer. 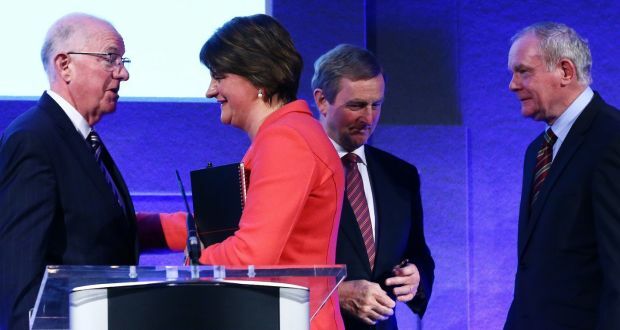 On Monday, the DUP MP Jeffrey Donaldson again criticised the Taoiseach’s determination to push ahead with the forum, suggesting it was driven by domestic political reasons. It is understood that the First Minister’s office had not been briefed in detail in advance of the Government’s announcement. The dialogue will be asked to produce a report and recommendations which will be used to help inform the Government’s position on issues related to the UK’s exit negotiations, according to the Government statement. It is expected that business groups, trade unions, community and voluntary NGOs from North and South will be invited in the coming days, along with organisations such as the British-Irish Chamber of Commerce, the Institute of European Affairs and the European Movement. Local authorities in Border areas are also likely to be invited, as well as some Government agencies and universities and higher education institutions. The main political parties North and South will also be asked to attend. Officers claim concerted campaign to discredit previous Garda whistle-blower? Minister for Justice Frances Fitzgerald has confirmed that disclosures have been made to her under whistle-blower provisions in recent days. Allegations of a concerted campaign within An Garda Siochana to discredit a whistle-blower have been made by two other members of the force. It is understood of the two Garda officers who have now come forward, one has said he took an active part in targeting the whistle-blower because he had been ordered to do so. 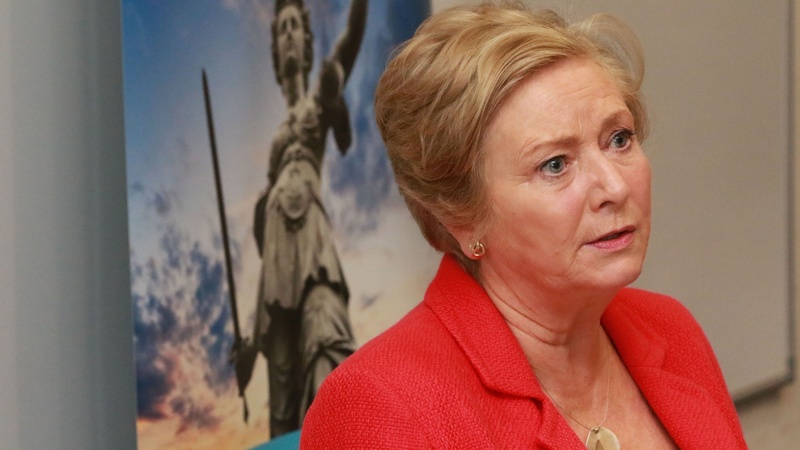 Tánaiste and Minister for Justice Frances Fitzgerald has confirmed in response to queries from the media that disclosures have been made to her under whistle-blower provisions in recent days. However, while she has not disclosed their content, it is understood they centre on allegations of a concerted campaign to discredit a previous whistle-blower. It is alleged efforts were made to monitor the whistle-blower, including his activity in the Garda’s PULSE database and to discredit him by negatively briefing journalists and politician and that intelligence about him was gathered. The veracity of the claims, made last week, has yet to be tested. However, with two Garda officers having turned whistle-blower about efforts to undermine a previous whistle-blower, questions will be raised about whether the Garda culture has absorbed the impact of recent controversies. Garda Commissioner Nóirín O’Sullivan has previously said that anybody coming forward with complaints or allegations about the Garda would be listened to and their complaints acted on. In reply to queries on the latest allegations, which emerged in the Examiner Newspaper, Commissioner O’Sullivan reiterated that stance. The Tánaiste confirmed the disclosures have been made under the Protected Disclosures Act, 2014, under which Garda members must be protected from any negative reaction to their coming forward. A statement from her office added: “Any such disclosures will, of course, be fully considered to determine what further action may be appropriate. In the past when complaints or disclosures have been made they have been examined, usually by a barrister appointed by the Department of Justice, before a full investigative process has been begun. Dee Forbes left pic, the new director general of RTE. and Pat Kenny right pic. RTE is to put an emphasis on creating more original Irish drama and increasing its international footprint, new director general Dee Forbes has said. She also opened the door to working with the station’s rivals as the Irish media landscape becomes more “busy”. Ms Forbes was speaking at the tenth annual Women Mean Business (WMB) Awards, where she spoke of her plans for her new role. She also touted the idea of a centralised Irish media hub, but said it was merely a thought. The Cork native will also look to capitalise on the Irish diaspora, of which she said only five million out of 40 are engaged with Irish media. Ms Forbes has enjoyed a hectic start to life at the Montrose station with potential losses set to reach €20m this year. Last month the former Discovery executive was also told by Communications Minister Denis Naughten that she must deal with the station’s weakening finances without the help of an increase in the licence fee. RTE has had to deal with the departure of four senior staff members over the last number of months, including former head of news and deputy director general Kevin Bakhurst. Six awards were presented at the WMB conference in the Shelbourne Hotel in Dublin yesterday. Complete Laboratory Solutions founder Evelyn O’Toole scooped the overall businesswoman of the year award, while Polar Ice’s managing director Alison Ritchie received the WMB entrepreneur of the year award. Other winners included FoodCloud co-founders Iseult Ward and Aoibheann O’Brien, who received the Newstalk social entrepreneur award. Space Technology Ireland founder Professor Susan McKenna-Lawlor picked up the FEXCO woman in technology award while Silicon republic co-founder Ann O’Dea received the Boots empowering women accolade. Dublin Cookie Company founders Elaine Cohalan and Jenny Synnott scooped the Sodexo newcomer award. Ben Stiller reveals how prostate cancer diagnosis (PSA Test) saved his life. Hollywood star Ben Stiller has revealed he was diagnosed with prostate cancer but is now cancer-free. The Zoolander star was diagnosed with a growing tumour in 2014 and now wants to share his story in support of the controversial test that saved his life. In an essay on the website Medium, Stiller described the moment of his diagnosis as “a classic Walter White moment, except I was me, and no one was filming anything at all”. He said straight after he was diagnosed he immediately researched high-profile men who had survived and died of the disease. He added: ” As I learned more about my disease (one of the key learnings is not to Google “people who died of prostate cancer” immediately after being diagnosed with prostate cancer), I was able to wrap my head around the fact that I was incredibly fortunate. Fortunate because my cancer was detected early enough to treat. And also because my internist gave me a test he didn’t have to. Stiller said he was not offering a scientific point of view on the test but said without it he would not have been diagnosed as quickly as he was. He wrote: ” The bottom line for me: I was lucky enough to have a doctor who gave me what they call a “baseline” PSA test when I was about 46. I have no history of prostate cancer in my family and I am not in the high-risk group, being neither – to the best of my knowledge – of African or Scandinavian ancestry. I had no symptoms. 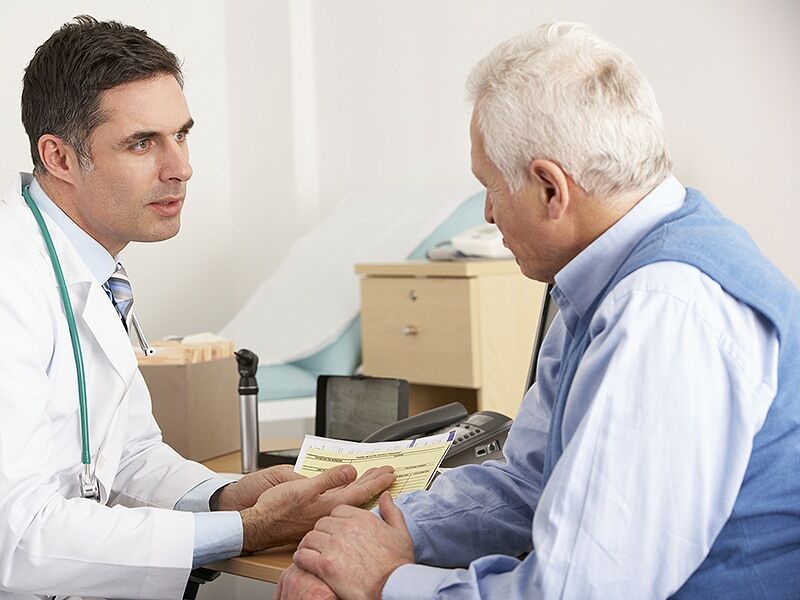 “What I had – and I’m healthy today because of it – was a thoughtful internist who felt like I was around the age to start checking my PSA level, and discussed it with me. The actor said the test is criticised because it can lead to unnecessary “over-treatment” but argued men should at least be given the option so they stand a chance of early detection. Angela Culhane, chief executive at Prostate Cancer UK, said: “There are over 300,000 men in the UK who, like Ben Stiller, are living with or after prostate cancer. However, despite the numbers, it’s a disease that, due to its nature, is often swept under the carpet. We applaud Ben for his courage in talking openly about his personal experience. “The disease kills one man every hour in the UK but if it is caught early, it can more often than not be treated successfully, which is why awareness like this is so important. It is crucial for every man to acknowledge the threat that prostate cancer can pose to his life. Mother and daughter in the right picture? New statistics show that if an Irish woman reaches the age of 80, she is likely to live an extra nine years. 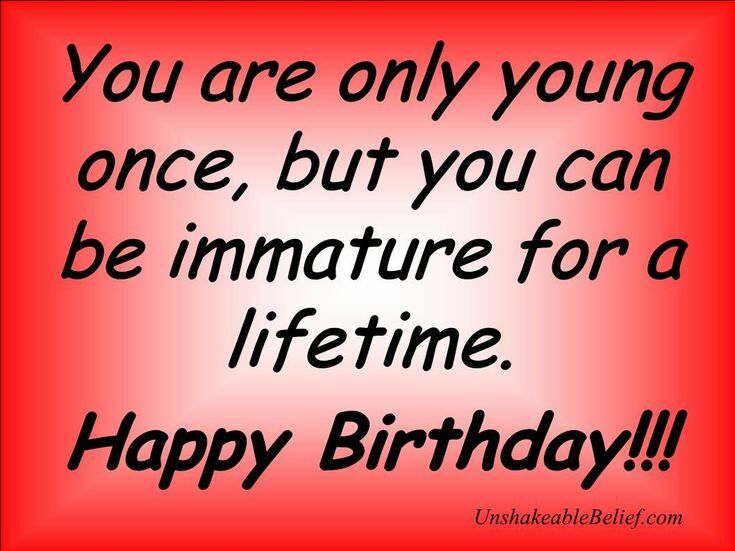 A man is likely to live another seven years. The figures from Eurostat show that people in France have the longest life expectancy and can expect to live an extra 11 years if they reach the 80 mark. Spanish nationals were close behind in the study with an extra 10.4 years. Ruth Deasy of the EU office in Dublin says the Eurostat figures reveal that women across the European Union are living longer than men. “Well it shows if you reach 80 years of age you’ve a very good chance of living several more years, almost nine if you are a woman in Ireland and almost seven if you are a man. 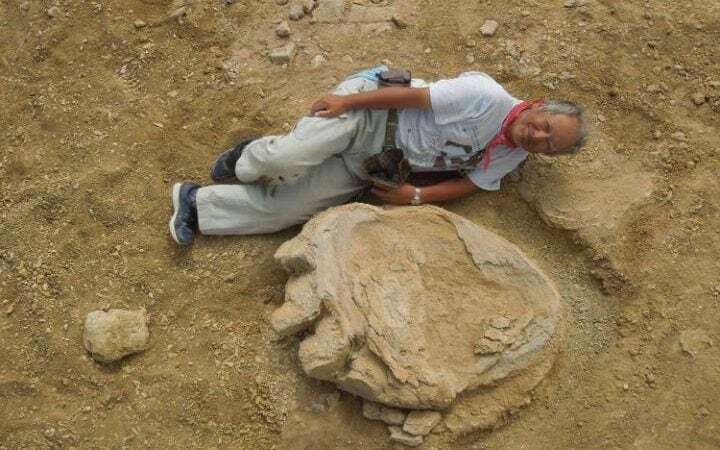 Professor Shinobu Ishigaki (above left) lying next to a dinosaur footprint in the Mongolian Gobi Desert. Scientists have unearthed in Mongolia’s Gobi Desert one of the biggest dinosaur footprints ever recorded, measuring over a metre in length. The enormous print, which measures 106cm (42 inches) in length and 77cm in width and dates back more than 70 million years, offers a fresh clue about the giant creatures that roamed the earth millions of years ago, scientists from the Okayama University of Science said. One of several footprints discovered in the vast Mongolian desert, the huge fossil was unearthed in August by a joint Mongolian-Japanese expedition in a geologic layer formed between 70 million and 90 million years ago in the late Cretaceous Period, researchers said. A drawing illustrating the dinosaur that may have left a footprint in Mongolia’s Gobi Desert. It was naturally cast, as sand flowed into dents that had been left by the creature stomping on the once muddy ground, news agency AFP reported. “This is a very rare discovery as it’s a well-preserved fossil footprint that is more than a metre long with imprints of its claws,” said a statement issued by Okayama University of Science. The footprint is believed to have belonged to a Titanosaur, a group of long-necked herbivore sauropods that lived in the Late Cretaceous period, and could have been more than 30 metres long and 20 metres tall, according to Shinobu Ishigaki, a professor from the Okayama University of Science, and the leader of Japan’s research team. “Footprints are living evidence of dinosaurs,” Masateru Shibata, a researcher with the Dinosaur Research Institute at Fukui Prefectural University, told the Japanese daily. Titanosaurs were the most diverse and abundant large-bodied herbivores in the southern continents during the final 30 million years of the Mesozoic Era. Titanosaurs species range from the weight of a cow to the weight of a sperm whale or more, according to scientists. 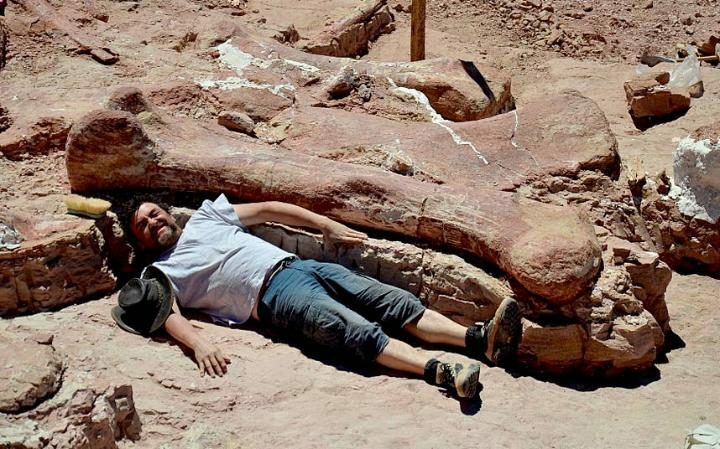 One of the paleontologists lies next to the femur of sauropod discovered in Argentina in 2014. Several Titanosaur species are regarded as the biggest land-living animals yet discovered. In 2014 remains of a gigantic Titanosaur were discovered in southern Patagonia, Argentina. According to palaeontologists, the Dreadnoughtus schrani, as the species was named, was the biggest dinosaur ever to walk the planet. Minister for Housing Simon Coveney and Minister for Social Protection Leo Varadkar announce higher rent supplement limits to help with rising rents. Fianna Fáil can take “some credit” for increases in rent supplement and housing assistance payments, the Minister for Housing has said. The Peter McVerry (above centre pic) Trust homeless charity said the new proposals would help keep more people in their homes and out of homelessness. Simon Coveney denied Fine Gael had argued against such measures in the negotiations with Fianna Fail. The Cabinet is expected to agree today to increase rent supplement and housing assistance payment with effect from next week. Mr Coveney said: “That is politics. Fianna Fáil can take credit, they did input into this decision but I think both parties agreed this was the right decision. The proposals to give extra financial assistance to people at risk of becoming homeless have been welcomed by charities. Homeless and housing charity The Simon Communities of Ireland welcomed the move but said payment levels must be aligned with market rents. “Rents have increased by 32.3% since April 2012 while rent limits have remained unchanged since June 2013. Rent supplement spend actually reduced by 40% between 2011 and 2015,” the charity said. Spokeswoman Niamh Randall said the numbers of people becoming homeless had been growing at alarming levels. There are currently 6,170 men, women and children in emergency homeless accommodation nationally – some 1,054 families with 2,177 children. “Homelessness can and should be prevented; keeping people in their homes is critical to preventing the stress and trauma of homelessness for more people and families,” Ms Randall said. A study by the Simon Communities suggested 95% of properties available to rent were priced beyond the reach of people, depending on state rent supports for their housing, Ms Randall said. She expressed concern that the high number of buy-to-let properties in distress had the potential to drive more people into homelessness. Measures must be put in place to ensure these tenants are protected and that a further reduction in the number of properties in the private rented sector was avoided. “At the moment, the system is very dependent on the private sector to provide people with homes,” Ms Randall said. She said it was vital that local authorities and approved housing bodies be given the resources to start to provide social housing. Chief executive Pat Doyle said the body’s recent submission to the Oireachtas Housing and Homeless Committee recommended an increase in rent supplement of between 28% and 35%. Mr Doyle said Tuesday’s planned announcement would help reduce the number of people who would have otherwise ended up in homeless services, right across the State. He called on the Government to immediately move to bring forward legislation on indexed linked rents. 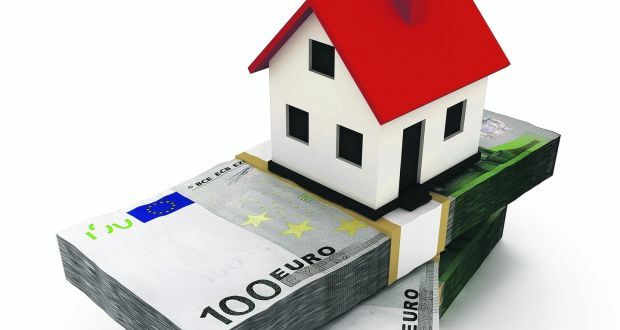 The Irish Property Owners’ Association said it had been requesting increases for a number of years but said the rent supplement was “not fit for purpose”. Separately, property consultants Savills Ireland said Wednesday’s CSO figures were likely to see a further increase in Dublin house price inflation. Director of research Dr John McCartney said that while it had gone largely unnoticed, the annual rate of house price growth had nearly doubled from 2.6% last December to 4.6% in April. He said this pick-up would continue over the summer months. “Firstly a strong base effect is about to kick-in. House price inflation slowed sharply last May and June. Therefore even modest increases this summer will see an uplift in the annual rate of inflation. The Haddington Road deal formally expires on Thursday night, leaving employer unions and staff associations outside a collective agreement. Gardaí and second-level teachers, like the bulk of public servants, receive regular incremental pay rises as they move along in their careers. And while public service wages were cut following the economic crash, increments continued to be paid, albeit with delays in some cases. As things stand at present within the next week or so a garda is facing being told that his or her increment for this year is being withheld and that they will not get another one until 2018. Increments for most teachers are generally not due to be paid until the autumn when the school year recommences. The imposition of such financial penalties such as the forfeiture of increments will undoubtedly lead to conflict between the Government and the Garda Representative Association and the Association of Secondary Teachers inIreland (ASTI) – a development which could lead to school closures in September and some form of action by gardaí. For teachers, increments are not the only potential penalty. They may also lose nearly €800 due in supervision and substitution payments in September as well as removal of protection against compulsory redundancy. The heart of the issue is the rejection by rank-and-file gardaí and ASTImembers of the Lansdowne Road pay deal. The accord which came into effect last January provides for limited pay restoration for those affected by wage cuts during the financial crash. Unions representing about 288,000 civil and public servants have already backed the accord, which is the centrepiece of the Government’s public service pay and industrial relations policy. The Government considers Lansdowne Road to be an extension of the previous Haddington Road public service agreement under which teachers and officers were obliged respectively to carry out 33 and 30 additional unpaid hours each year. The Government, for its part under Haddington Road was supposed to arrange for a review of Garda pay to be put in pace. This was due to have been completed in 2014. However this process was delayed and last months its chairman resigned. Consequently, it is unclear when the matter will be finalised. 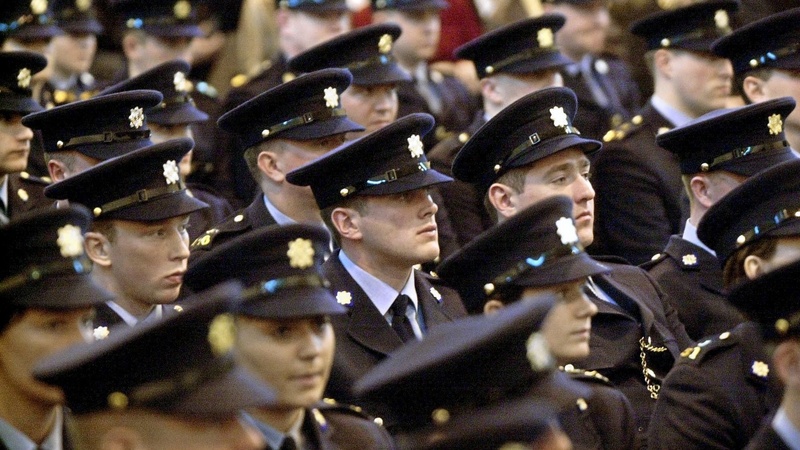 Rank-and-file gardaí last December ceased carrying out the 30 unpaid hours. Last month ASTI members voted to withdraw from the 33 additional hours they were carrying out in schools. The former Fine Gael-Labour government last autumn introduced new financial emergency legislation which allowed ministers to impose financial penalties such as forfeiture of increments on groups deemed to have repudiated a public service collective agreement. Gardaí and ASTI members backed the Haddington Road deal but it formally expires on Thursday night, leaving as things stand at present, both groups outside a collective agreement. The Government in moving to take action against rank-and-file gardaí and ASTI members in schools would be seeking to shore up its central public service pay policy. Minister for Public Expenditure Paschal Donohoe on Tuesday said that the decision of unions representing nearly 300,000 workers in the public service to back the Lansdowne Road accord also had to be respected by the Government. In this the Government is conscious of one of the iron laws of public service industrial relations – that every group watches every other group like hawks to ensure they do not secure additional benefits denied to their members. Unions which accepted unpalatable measures under Lansdowne Road and its predecessors would not be happy, to say the least, if the Government changed arrangements for gardaí and teachers who did not back the accord. Any move by the Government which reduced or eliminated the requirement for gardaí and teachers to carry out additional unpaid hours would immediately lead to claims for similar arrangements to be put in place for other groups such as nurses and civil servants and could ultimately lead to the unravelling of the Lansdowne Road edifice. 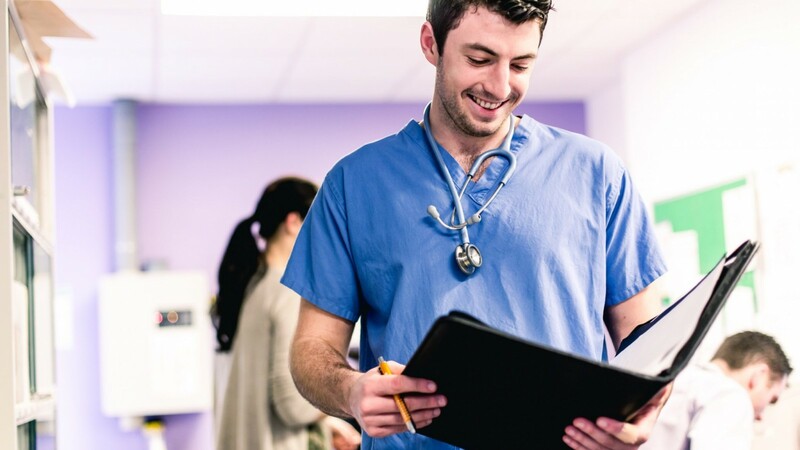 Nearly 40,000 nurses working in the public health service have had to work 1½ additional unpaid hours a week over recent years – a requirement that is deeply resented. Already it is likely that nurses will campaign in the autumn for these to be dropped. Concessions to gardaí or teachers on hours would intensify such a development. On the other hand any move by the Government to impose financial penalties on nearly 30,000 gardaí and teachers is very likely to lead to significant industrial relations difficulties in the weeks ahead. Tourism Ireland today (28 June) welcomed news of an almost 14% jump in overseas visitors in the period January to May 2016. Commenting on today’s figures from the CSO for overseas visitors to Ireland in the first five months of the year, Niall Gibbons, CEO of Tourism Ireland, said: “Today’s figures represent an excellent performance for overseas tourism to date, with growth of almost +14% for January to May. Gibbons added that the outcome of the recent EU referendum in the UK has given rise to economic uncertainty and currency movements, which have the capacity to hamper growth. “Tourism Ireland is liaising with our key stakeholders and monitoring developments. We are determined to get the message out that it is business as usual. Britain remains an extremely important market for Irish tourism and Tourism Ireland is undertaking an extensive programme of promotions in Britain, and elsewhere around the world, to ensure this strong performance continues. Our aim is to ensure that 2016 is another record-breaking year for Irish tourism,” he said. Study by University College Cork calls for guidelines on nutrition for pregnant women. Expecting mothers with high levels of vitamin D are less likely to have serious pregnancy complications, new Irish research indicates. High vitamin D status is associated with lower risk of complications such as pre-eclampsia and small-for-gestational age (SGA) birth, according to the study by scientists in University College Cork. The research, published in the American Journal of Clinical Nutrition, found 17 per cent of pregnant women had a Vitamin D deficiency among almost 1,800 who were surveyed. This compared to 12 per cent among women who were not pregnant. The researchers say their findings highlight the need for national guidelines on nutritional intake, include Vitamin D levels, or pregnant women. “The data highlights the need to conduct nutrition research in vulnerable populations, such as pregnancy and breastfeeding women and children, in order to develop life-stage specific recommendations for nutrient intakes,” according to Prof Mairead Kiely. The study surveyed 1,786 mothers who attended Cork University Maternity Hospital and was designed to explore whether there was a connection between vitamin D status in early pregnancy and any major pregnancy complications. 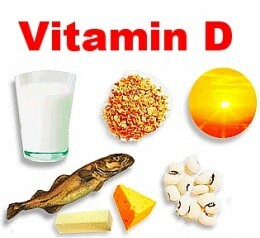 Vitamin D is produced in the body by exposure of the skin to sunlight. 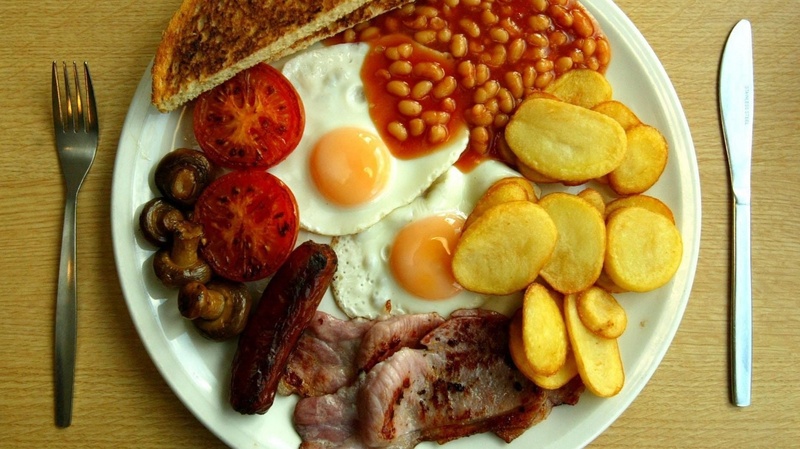 It is also found in oily fish, egg yolks and fortified foods such as milk, breakfast cereals and infant formula. 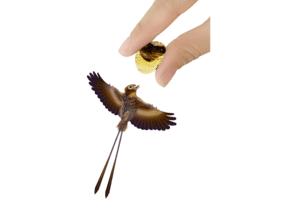 What can ancient amber-encased bird wings say about flight? CLOCKWISE FROM TOP LEFT: A compound microscope images shows interlocking barbs and barbules on the bird’s flight feathers. A view of a feather suspended in amber. A fossilized skin flap shows the follicles where feathers insert into the flesh. the leading edge of one wing, including the tiny claw at the wing-tip. Two chunks of amber preserved the wings of baby birds 99 million years ago. Dinosaurs were roaming the Earth and flowering plants were just beginning to flourish when two tiny baby birds lived their short lives. These walnut-brown, toothed hatchlings hadn’t grown larger than today’s hummingbirds when they encountered wads of sticky, goopy tree resin. Perhaps the newborn enantiornithes were taking their first flights, stumbling out of a nest, clambering around the treetops, or maybe they fell into the sticky trap when a wing became ensnared in the resin and the little birds weren’t able to pull it loose. Now, 99 million years later, that resin has hardened into amber around those tiny wings, preserving them, bones, tissue, feathers and all. And they’re offering scientists a glimpse back in time. “Enantiornithines, these strange, toothed birds, had plumage that looked a lot like adult bird plumage, even when they were just hatchlings,” says Ryan McKellar, curator of invertebrate paleontology at the Royal Saskatchewan Museum who helped analyze the new fossils for a paper published Tuesdayin the journal Nature Communications. Looking at the bones of these amber-encased wings, the scientists were able to tell that these birds were quite young. But their adult-like feathers suggested these tiny hatchlings may have been able to fly “right out of the egg, or right out of the nest,” Dr. McKellar tells The Christian Science Monitor in a phone interview. When you think of fossils you might picture a compression fossil, in which an animal’s skeleton has been preserved in a layer of sedimentary rock. Occasionally the tissues, fur, or feathers of an animal leaves some sort of imprint in the rock around the bones. That’s where amber fossils come in. As tree resin turns into amber over time, it preserves an organism in place, tissue and all. The resin contains natural preservatives, entomologist George Poinar, known for studying amber fossils, previously explained to the Monitor. “Amber can be a really valuable supplement to these compression fossils” because it can preserve animals in such lifelike detail, McKellar says. In life, these little birds had walnut-brown coloring on the upper side of their wings, with a paler band running across their wings. The wings’ underside was very pale, perhaps even white. Two long, ribbon-like tail feathers trailed behind the tiny birds’ bodies. In their beaks, these young enantiornithines had teeth, hinting at their dinosaur ancestry. “They’re thought to be some of the closest relatives to modern birds,” McKellar says. Today enantiornithines are extinct. “The fact that well-preserved plumage is now being found in 100-million-year old amber is remarkable, and very cool, but the [new] information in these two specimens is limited,” Luis Chiappe, director of the Dinosaur Institute at the National History Museum of Los Angeles County who was not part of this study, tells the Monitor in an email. “The authors are correct to highlight the high degree of development of the feathers and how the presence of fully formed flight feathers in hatchlings suggest a high degree of precociality,” the extent to which a young organism shows mature features and behaviors, such as mobility. But “this has already been mentioned, many times, based on the presence of similar feathers in traditional fossils as well as osteological studies correlating bone formation (ossification) with precociality,” Dr. Chiappe says. McKellar agrees that these fossils confirm previous descriptions of enantiornithines based on compression fossils. But he hopes that this study will encourage scientists to turn to amber fossils more readily to find new insights into ancient organisms. These chunks of amber are about the size of ping-pong balls, McKellar says. And the wings embedded in this amber are just fragments, a few bones of the tip of the bird’s wing with feathers fanning across them. 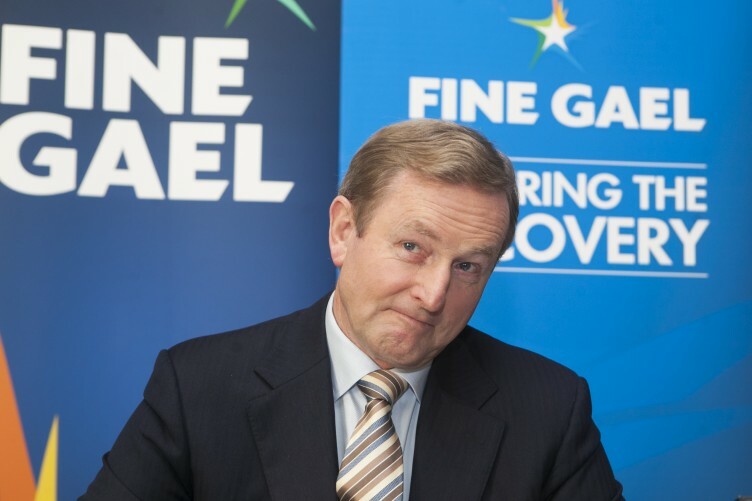 Enda Kenny is to offer Independents and smaller parties a five-year deal that will remain in force even if he leaves office, in a bid to win their support for a minority Fine Gael government. A proposed programme for government may be put to a special Fine Gael conference to guarantee the party’s commitment to the deal. Next week, Mr Kenny will seek the approval of his parliamentary party to continue negotiations with members of the Independent Alliance, the Green Party’s two TDs and several other Independents. The proposed deal will pledge major initiatives to deal with housing and health issues, along with a range of measures to spread the economic recovery into rural areas. Such an emphasis will help Fine Gael to “navigate the centre ground of Irish politics”, according to a high-level party source. The manoeuvres reflect a growing confidence in Mr Kenny’s circle that Fine Gael can put forward a credible minority government option. Fine Gael intends to focus on policy areas the party believes cost it support during the election campaign as it works to put together a five-year programme for government, with or without Fianna Fáil support. Mr Kenny will put a short document before his TDs reaffirming the party’s election manifesto proposals while also emphasising how to link “our economic proposition with social justice and a fair society”. TDs have made written submissions outlining the areas in which they felt Fine Gael was weak during the campaign. The issue of Mr Kenny stepping down as Fine Gael leader has been raised in negotiations with Independents and smaller parties. 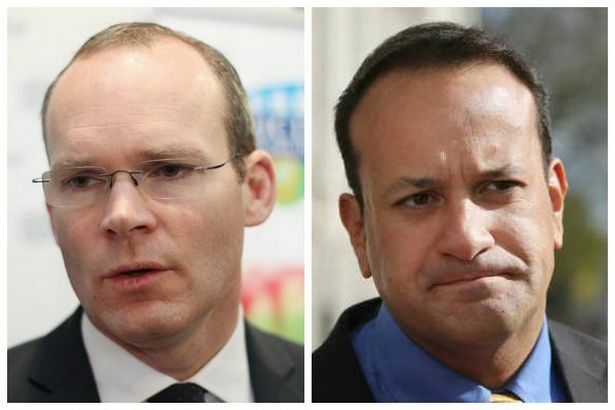 He has already said he will not lead Fine Gael into another election and the party has been asked if his successor would honour the terms of any agreement reached in the weeks ahead. Sources said Mr Kenny was considering putting a programme for government before a special convention or ardfheis to effectively tie the party as a whole, rather than simply the current leadership, into any agreement. Fine Gael is still open to negotiations with Fianna Fáil, either for a coalition administration or some framework for supporting a Fine Gael minority government. While Fianna Fáil sources have suggested such a framework could be for a period of two years, Fine Gael wants a five-year programme. It intends to work on such a programme with Independents and others, such as the Green Party, in the weeks ahead. The programme could then be offered to Fianna Fáil to see if it wanted to sign up to it. “You’d have to listen to their views and what the conditions of their support are,” a Fine Gael source said. However, it is felt that even if Fianna Fáil does not formally support a Fine Gael minority government, Micheál Martin would find it hard to oppose a budget framed to appeal to the centre ground. Such a budget would contain measures broadly similar to those proposed in the Fine Gael, Fianna Fáil and Labour Party manifestos..
Padraig McGarry, (Left Pic) chairman of the Irish Medical Organisation’s GP Committee. 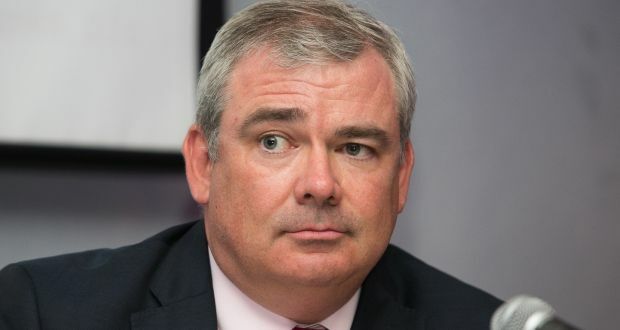 An investigation is required to determine the exact level of doctors failing to meet the professional competence requirements, according to Padraig McGarry, chairman of the Irish Medical Organisation’s GP Committee. Doctors are obliged to complete 50 hours of Compulsory Professional Development courses every year which includes clinical meetings. 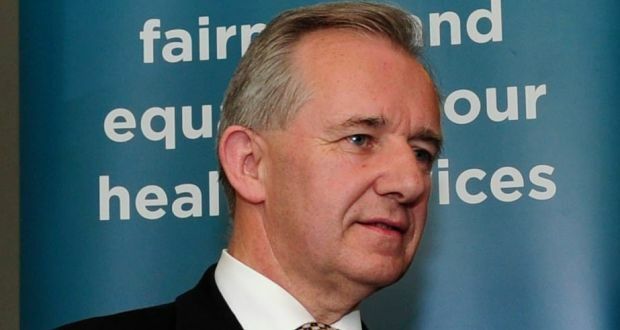 The chief executive of the Irish Medical Council Bill Brasifka told the Medical Independent 30 per cent of doctors are not meeting their CPD requirements. But Mr McGarry said this figure was incorrect as it failed to take into consideration doctors working abroad, those on maternity leave or sick leave and includes locums who would not have the time to carry out the extra requirements. “It would be an onerous task to do that on top of the 60 hours they work a week, and many cannot just do the CPD courses because of the stress,” explained Mr McGarry. He called for an investigation into the exact levels of non-compliance before fines or other measures were considered. AA Ireland said the average price for a litre of petrol in Ireland is now 121.1 cent. Rising oil prices are starting to have an impact at forecourts with a decline in the cost of fuel slowing considerably last month, according to AA Ireland. However, the organisation said motorists are unlikely to see a big jump in the cost of fuel anytime soon as oversupply issues persist. 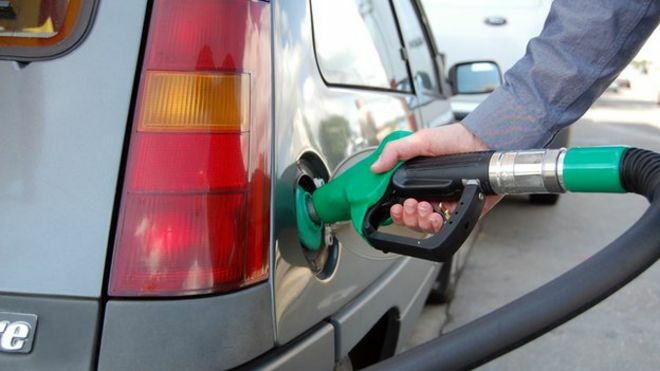 AA Ireland said the average price for a litre of petrol in Ireland is now 121.1 cent, down 0.9 per cent on February but still considerably lower than the 153.1 cents being charged two years ago. Diesel rose by 0.9 cents last month to an average of 106.3 cents. AA Ireland said that while prices are rebounding, motorists are unlikely to notice a big difference in the coming months. “The price of oil has come up off the floor in the last few weeks but the recovery is nothing to be excited about and the problems of oversupply are still there. That may cause all sorts of problems for oil producers and for some parts of the global economy but by and large it is good for us, and it is certainly good for motorists.” said director of consumer affairs Conor Faughnan. 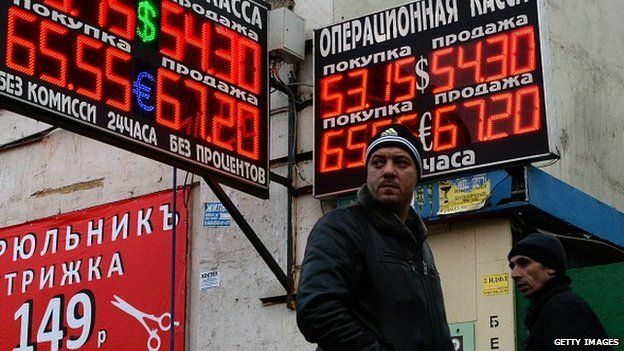 Oil prices fell as low as $27 dollars per barrel on world markets around mid-January before recovering to a current level of about $40. Prior to this, prices had averaged over $100 until the start of 2014 when the cost spiralled downwards. The fall in oil prices has been of great benefit to the public with the average motorist saving as much as €48 per month due to lower petrol prices. Overall, the cost of petrol has fallen by 21 per cent in Ireland, compared to a 64 per cent decline in oil prices. Mr Faughnan said the high rate of excise duty on fuel here meant Irish motorists were not benefiting as much from price reductions as motorists in other jurisdictions. Lager, ale or blonde? 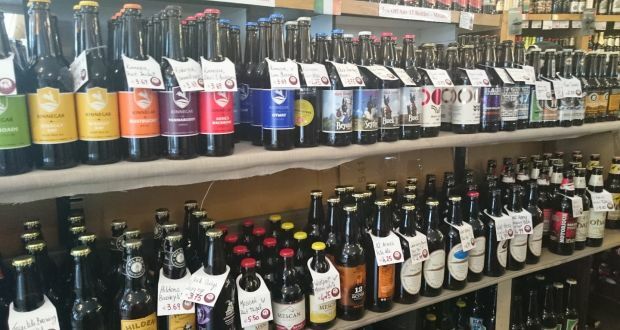 Where to start with craft beer in Ireland? Choosing a beer these days can be tricky. IPAs, imperial stouts, red ales, blondes and the list is endless. It’s a good thing, of course, with so many new Irish and international offerings. But it can be hard knowing what to try or where to begin. 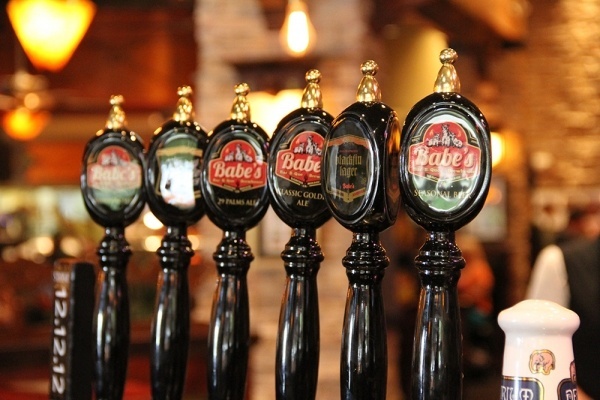 All beers fall loosely into two categories: lagers and ales. Light lagers have been the dominant beer style over the last 50 years or so, while ales have seen a massive resurgence with the recent craft beer boom. What’s the difference between an ale and a lager? Yeast. “Lager” means “to store”, and lager yeasts are active at lower temperatures which is why the style originated in cooler climates, such as Germany. We all know the crisp, light and golden lager; however there are many variations and colours, depending on the malts used. The clean and sweet grainy flavour of the Munich helles (light), for example, comes from Pilsner malt. The more characterful Bohemian Pils became the template for many mainstream lagers, the archetype being the Czech Pilsner Urquel or “original”. Ales – which include wheat beers and stouts – use yeasts which ferment at slightly warmer temperatures. While ales have a long history in Ireland and England, the craft beer movement began with the rise of the American pale ale which showcased pungent US hops with citrus and grapefruit flavours – Sierra Nevada among the first. Cork brewers Cotton Ball do a cracking pilsner called Mayfield 5 – the perfect lager for anyone looking for an intro to craft beer scene. For a tasty light blonde ale with a summery tropical fruit zing try Pass If You Can by Hope Beer. 33 Sticke Alt by Northbound Brewing is an easy drinker, malty with a hint of bitterness, and is a hybrid lagered ale – but that’s a whole other story. Patrol car was rammed after a high speed pursuit in Co Donegal early on Friday. A Garda had to be cut from his patrol car after it was rammed following a high-speed pursuit in Co Donegal early on Friday. 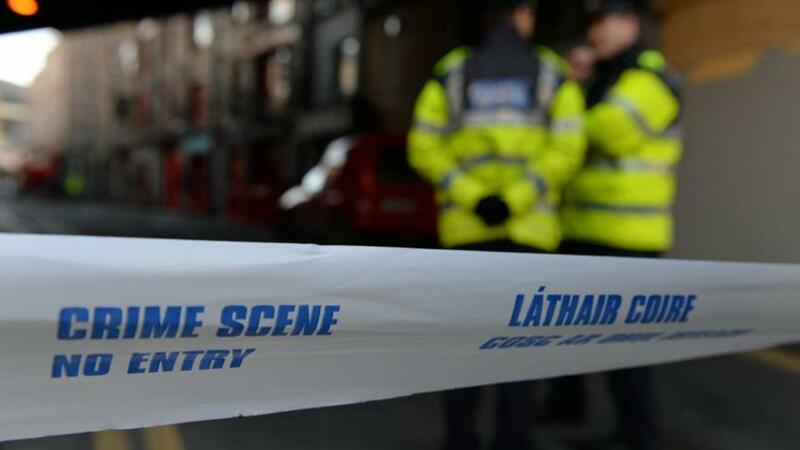 The collision happened at McGrory’s Brae, between Ballybofey and Donegal town, when a black Fiat Punto crashed into a garda car. The Punto had been pursued after failing to stop for gardaí in Donegal. It is unclear if a stinger-style device was deployed in a bid to stop the car. The garda inside the patrol car was cut free by fire crews and was taken toLetterkenny University Hospital for treatment for minor injuries. The driver of the Punto remains in hospital and gardai are waiting to interview him. A Garda spokesman said the Ombudsman attended the scene as a matter of routine but are not investigating the incident. He said gardai were appealing for anyone who saw the Punto on theBarnesmore Gap early on Friday to contact Letterkenny Garda station at (091) 67100 or the Garda Confidential Line 1800 666 111. 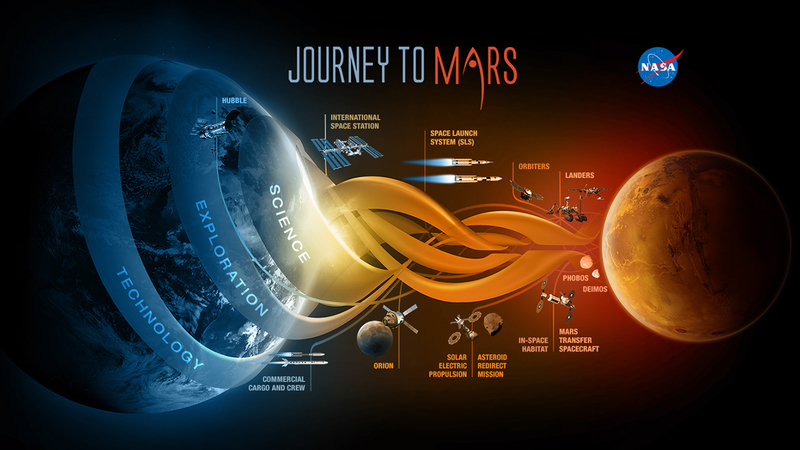 What will a mission to Mars hope to discover? An artist’s impression of the ExoMars 2016 mission, a collaboration between the European and Russian space agencies, shows the lander, Schiaparelli, separating from the orbiter. The mission blasted off from Kazakhstan last week and the spacecraft is expected to arrive in October. It will study dust storms and gases like methane, a hot topic because it can be created in a process requiring heat and liquid water. While countries in Europe have been slashing budgets, one area has not just escaped the ax but chalked up a stellar jump: space exploration. The European Space Agency (ESA) has seen its budget expand 75 percent since 2008, unscathed by the region’s sovereign debt crisis. The project, which draws contributions from individual member nations, has become a rare force of unity in a region that’s struggling with an unprecedented refugee crisis, a potential British exit from the European Union and an unresolved conflict between Ukraine and Russia. From a space center in Kazakhstan, ESA is sending into deep space an orbiter tasked with gathering critical scientific data. Attached is a spacecraft that will head to the Martian surface to test the ability of Europeans to safely land on the planet. Monday’s liftoff is the first of two launches that will see a rover on Mars by 2020, joining NASA’s Curiosity, which is already there. The orbiter has several scientific tasks: one is to sniff out any trace of methane, the gas that could be a signpost of life; another is to map out precisely when the rover can try to land, starting in 2018. While an earlier spacecraft launched during ESA’s mission in 2003 called Mars Express is still mapping, photographing and making useful scientific measurements, the lander sent with it was never able to transmit data to ESA. The budget of ESA, an agency backed by 22 European nations, has risen 75 percent since 2008 to $5.8 billion (though that’s less than a third of NASA’s $19 billion). The support shows that Europe wants to be a key actor in the arena. ESA also has made space exploration missions like the ExoMars more palatable by providing returns on investment. For each member, 1 euro invested in ESA generates between 5 and 7 euros in collateral investments in industry and jobs, the agency said. Current system of finding staff is highly inefficient’ as many lose interest in the long process. 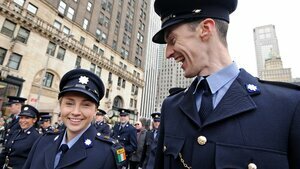 An Garda Síochána should, for the first time, put a concerted effort into recruiting police officers currently serving in other countries, the Garda Inspectorate report recommends. Robert Olson, the author of the report, also says Garda management should begin to actively consult with Government ministers and departments about the force’s budget allocation, a process which it currently has no direct involvement in. Following the HSE’s attempts to entice Irish nurses employed abroad to accept posts at home, the report advises the Garda to employ a similar strategy given the number of fully-trained Irish ex-pats serving in police forces around the world. An Garda Síochána does not currently have a targeted programme for overseas recruitment, points out former Minneapolis chief of police Mr Olson, who also brands the current recruitment system as “highly inefficient” as many applicants lose interest or find employment elsewhere during the months or years-long selection process. The report also identifies “skills deficits” among gardaí due to a lack of training and continuous professional development afforded to members over recent years, and recommends that a programme of “ongoing continuous professional development” should be made available to all personnel. The Garda College in Templemore should have its own ringfenced budget, and there should be a review of the 32-week residential training course for gardaí at the college “with a view to reducing the duration” of that programme in favour of more time in operational settings and on independent patrol for trainees. 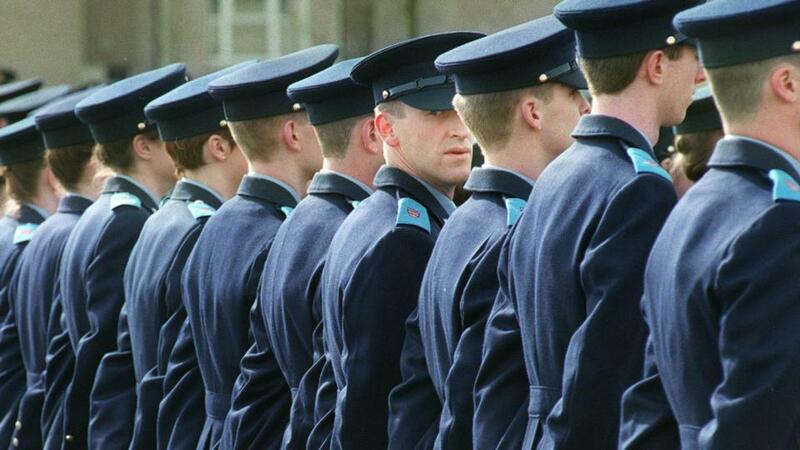 “The majority of Garda training takes place at the college. This is expensive and inefficient,” says the report. 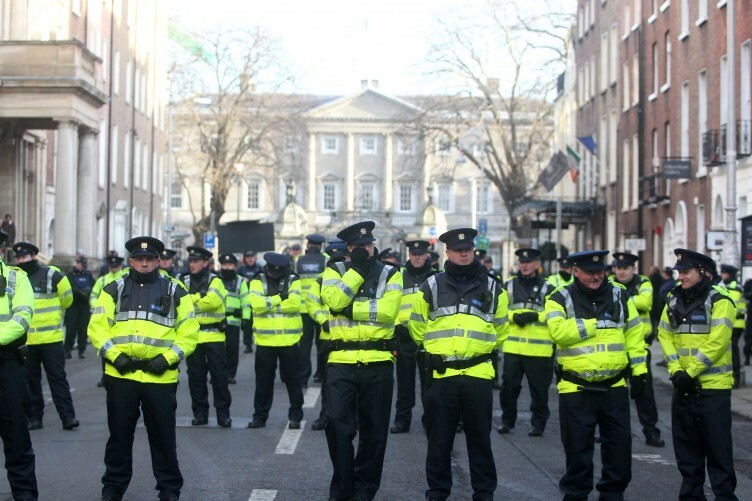 It adds that volunteers with the 1,000-member Garda Reserve could be put to better use, and divesting some time and labour-intensive duties currently carried out by rank and file gardaí such as custody services and healthcare for people in custody to other agencies could also free up additional operational capacity. Members of the reserve were recently given more powers, meaning they could perform duties including foot patrol and road traffic checkpoints if accompanied by a full-time Garda. Elsewhere, the report says that in order to optimise cost recovery An Garda Síochána should consider addressing the situation whereby the full costs of policing public events are not met by promoters. Regarding responses to false alarms, an increased call-out fee for the property owner in such circumstances would also lead to greater efficiencies in cost recovery and could free up “thousands of Garda operational hours” if the deterrent is successful. There are currently no policies in place detailing how to deal with “high-risk” issues such as potential substance abuse and corruption among gardaí, and this should be addressed by developing clearer policies and providing training in those areas it says. As opposed to the existing policy, Mr Olson suggests that all uniformed gardaí should be issued with a name badge so individual on-duty officers could be more easily identified by members of the public. Environment Minister Alan Kelly is now considering the introduction of new rules surrounding the provision of social housing. Hundreds of families on council housing waiting lists are turning down homes because they don’t like the area. In several parts of the country, well over a third of offers made by councils have been turned down in the last year. The Department of the Environment is now closely monitoring rejection rates. In Dublin City – where the homeless crisis is most severe – almost one in five families turned down offers of homes. The refusal figure is as high as 49% in Cork county, 46%c in Waterford, 42% in counties Roscommon and Donegal and 40pc in Cork City. Families turn down offers of homes for a wide variety of reasons, including poor access to facilities such as schools and other important services. But councils are now telling the Department of the Environment of their frustration over so-called ‘serial refusers’. Officials say offers are being turned down in many cases simply because people don’t like the area or the house. Under the current system, those on the list give three preferred options for a new home – but often turn down an offer if it isn’t their first choice. The housing offer rejection figures are contained in a Department of Environment survey of the country’s housing departments, which has been seen by the Irish Independent. The figures relate to the 12-month period until the end of September. In feedback to the department, officials have warned that in many cases, families are rejecting offers because they say they do not feel suited to the area. “We do have to address the fact that people turn down homes because they don’t like the property being offered,” a senior Government source said. At the moment, if a family fails to provide a legitimate reason for turning down an offer of a home, they become ‘blacklisted’ for a 12-month period. In cases where a council receives three refusals from the same applicant, they can be struck off the list entirely. Mr Kelly will now consider new rules aimed at tackling the rate of refusals. These include reducing the number of refusals families can make before being struck off the housing list. The minister is also examining the introduction of a ‘choice-based letting’ system whereby applicants have greater say over the areas in which they are accommodated. One of the country’s leading housing experts called for a overhaul of the waiting list system. DIT lecturer in housing Dr Lorcan Sirr warned the issue is far more complex and said further studies are required into why families are refusing homes. But Dr Sirr said the figures show councils, in some cases, are dealing with families who reject offers for non- housing related reasons. He said that these include “tribal reasons” – families not wanting to live near each other – as well as a lack of suitability of the property being offered. “In times of depleted resources, this is obviously very frustrating for local authorities dealing not alone with issues of allocation of resources, but also with the sociological side of dealing with families and their non-housing issues that relate to where they want to live,” he said. A new study showed that watching TV in just three hours a day with little to no physical activity can rot the brain. 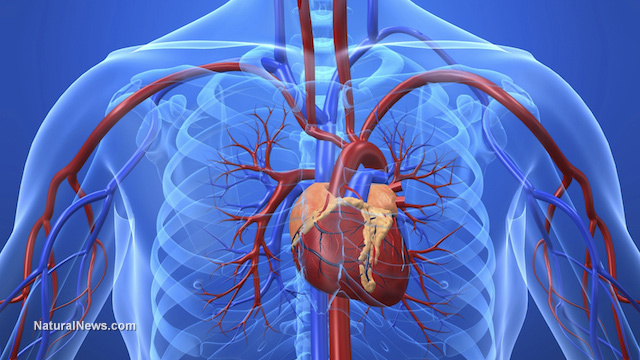 The data was based on a analysis of three tests answered by the participants involved in the study. Researchers Hoang and Dr. Kristine Yaffe, professors at the University Of California School Of Medicine found that these volunteers are all inclined to watching a lot of TV. Many people practice watching too much TV and oftentimes fail to do any physical activity. Doing both things for a long span of time leads to the impairment of the brain, as researchers found in their study performed at the Northern California Institute for Research and Education. Initially, the researchers did not include the cognitive function of the participants for them to have a baseline for comparison of the progress. And on the 25th year of the study, they assessed the cognitive function of the participants with three different mental tests that focus on speed, verbal memory and executive function. There were 107 volunteers involved in the study who exercised least and at the same time had the habit of watching TV for more than three hours a day. Results show that these people are twice as much likely to perform poorly on the cognitive tests,; given as compared to those who limit their TV use but exercised more. The researchers said that it is still never too late for adults to change their habits that could lead them to illnesses like Alzheimer’s disease and other types of dementia that usually start with impaired brain and damaged brain cells. Other studies have categorized these diseases due to old age, but there are ways where people can avoid it. Result show that TV addicts were found to be 64 percent more likely to have poor cognitive performance than others. Same results were obtained when the researchers accounted for several other factors such as age, gender, educational level and body mass index (BMI). They took note of some possible limitations due to the way the data were gathered because answers were only self-reported by the participants through the questionnaires. Adolescents who practice little exercise but watch TV frequently had the worst obvious cognitive function 25 years later in their life. In this part of the study, the participants were surveyed at the beginning of the study and every two to five years about their exercise routine, or if they do exercise at all. Those who watch little TV with high physical activity routine had twice as better cognitive performance than those who did little exercise with too much TV during their midlife. But the researchers found no link to the verbal memory of the participants with regards to TV use. Official guidelines for tattoo and body piercing parlours are being drawn up for the first time..
Official guidelines for tattoo and body piercing parlours are being drawn up for the first time. The Department of Health says the draft guidelines, to be published next week, will make recommendations on minimising the risk of infection, protecting the health and safety of tattoo artists and their customers and the operation of parlours within recognised rules and laws. Hundreds of tattoo and piercing shops have opened across Ireland in the past decade as the popularity of body art soars. However, the sector is largely unregulated, with no registration requirements, operating standards or basic training requirements for staff. The department says its guidelines will aim to ensure that high standards are “maintained” in the sector. A consultation process is planned before the draft guidelines are finalised. “Tattooing and body piercing has become increasingly popular as a fashion statement and the number of premises offering these services has multiplied,” says Minister for Health Leo Varadkar. Specific issues to be covered in the guidelines include good practice for infection control and the use of template consent forms and aftercare advice, as well as the need to provide training and supervision for staff and the avoidance of local anaesthetic injections of prescription only topical creams. The department says the majority of tattoos and piercings occur without incident, but risks arise with the procedures involved and customers need to be briefed in advance. As well as the dangers of infections and blood-borne viruses caused by poor hygiene, other problems include allergic reactions to ink or pigments, scarring and rejection of jewellery by the body. Less than half of the Irish population believe climate change is a serious problem, a new survey shows. Sustainable Energy Authority of Ireland (SEAI) carried out the poll asking 1,000 people for their views on climate issues facing Irish society as the UN Climate Change Conference (COP21) continues in Paris. The figures showed 49 per cent of the people who responded thought climate change was a serious problem. However, 53 per cent said they a role to play in tackling the problem ahead of businesses and environmental groups. Dr Eimear Cotter, head of the low carbon technologies at the SEAI, said the scientific analysis was indisputable and urgent action was needed. “However, we still have to convince half of the population of the seriousness of climate change,” she said. Dr Cotter said the research showed there had been a large increase in children’s perceived knowledge of saving energy and the influence they have on family attitudes. “This knowledge and influence will hopefully in time translate into wider societal awareness,” she said. The figures showed seven out of 10 said energy was an important consideration buying a car, while 60 per cent said power use was significant factor for kitchen appliances and lights . John Gibbons, a spokesman for An Taisce said low public awareness of climate change risks could be explained by lack of coverage. Taoiseach Enda Kenny has said it is “not realistic” to set a figure immediately on the number of refugees Ireland can take. 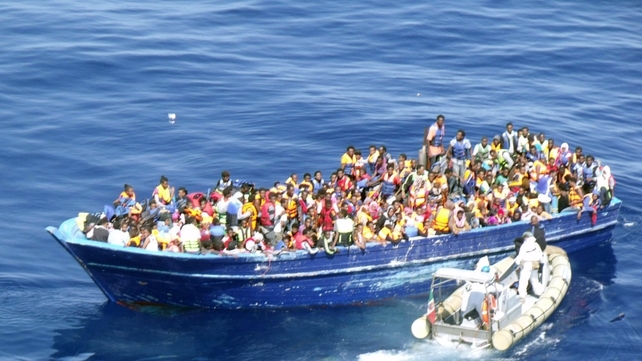 EU justice ministers will meet to discuss the migration crisis on September 14th. 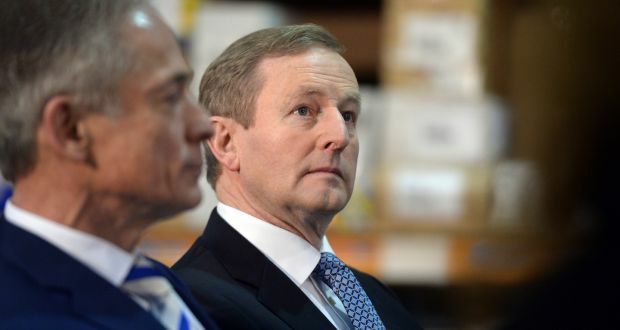 Regarding the numbers of asylum-seekers Ireland will accept, Mr Kenny noted that “We have opted into the protocol” (that is to say an EU Council decision in the Justice and Home Affairs area, where Ireland normally has an opt-out). Minister Fitzgerald said Ireland is “of course” willing to take more refugees than already committed to, and its ability to do that “will be looked at”. Speaking today she said she shared the “total upset the entire country feels at the images of the little boy [Aylan Kurdi], drowned on a beach”. She said there was “a huge sense that we must do more” but said the figure of 600, which is the number of refugees the Government has committed to take under the current European refugee relocation programme, was “just one statistic in a wider context” of increased numbers of people seeking asylum here and seeking residency under other criteria. Ireland would be “very proactive” on putting forward measures to deal with the crisis at the meeting on 14th September. She agreed there was an “appetite” among the Irish people for the Government to take more but said any increase in numbers had to be co-ordinated at an EU-level and a plan had to be in place here as to where and how they would be housed. She said there were already hundreds of people, who had been recognised as refugees but still living in direct provision centres, because they could not find housing. There was also a 50 per cent increase in the number of people arriving in Ireland and seeking asylum here, apart from those caught up in this crisis. “There is a wide range range of significant pressures and challenges,” she said. Her junior minister, Aodhán Ó Ríordain, said however he was “confident” the numbers to be given protection here would “increase substantially”. Minister Fitzgerald said there would be discussion at the September 14th meeting on how to best support countries with ‘hot-spots’ for migrants and refugees arriving. She expected extra aid to be provided so temporary housing and processing centres could be built to better accommodate the needs of arriving people. She also said the Dublin Convention, according to which asylum seekers must make their application for protection in the first EU country in which they land, was “clearly not working”. Most important, she said, was the safety of the migrating people, particularly during their attempts to cross the Mediterranean and Aegean seas. She said people-smugglers’ activities had to be disrupted while those desperate to make the crossing had to be rescued. Ministers and TDs have said Ireland must take more refugees than it has committed to so far. 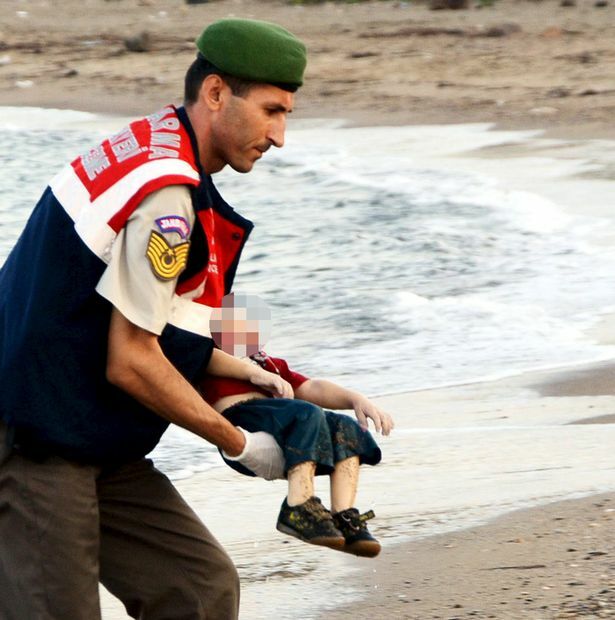 They have also said Ireland must take a leading role in pushing for a comprehensive EU response to the refugee crisis. Seán Sherlock, Minister of State at the Department of Foreign Affairs, said there was “a case to be made for taking in more refugees.”. He said Ireland had contributed €31 million towards the humanitarian effort on the ground in refugee camps along the Syrian borders, and pointed to the deployment of the Irish naval vessels in the Mediterranean who had saved hundreds of people from drowning while trying to cross toEurope. Pat Breen, chair of the joint committee on foreign affairs, said: “I think we could take more. It’s a balancing act. If we were to take an amount proportionate to the numbersGermany is taking, that would be 40,000. Obviously our economy couldn’t take that. But there is room for us to take more. He said the EU meeting of justice and home affairs ministers, scheduled for 10 days’ time in Brussels, should now be brought forward. An emergency discussion of the spiralling refugee crisis would be held when his committee reconvenes in coming weeks. “I also think the Dáil must have a debate on this within a day or two when it’s back on September 22nd,” he said. 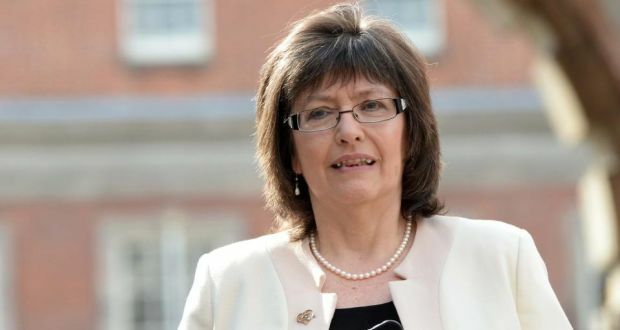 Joanna Tuffy, chair of the Oireachtas committee on education, also called for a larger number of refugees to be taken by Ireland, and said Ireland needed to “take a leadership role in Europe among other countries. We should be calling for a co-ordinated response across Europe. 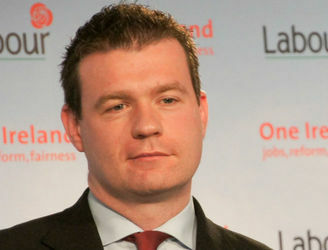 Labour TD Joe Costello said: “We certainly should be doing a lot more. We have to be prepared to take more refugees. We have a huge diaspora of our own and we have had our people welcomed in other countries. “It could be done at parish-level. There needs to be a buy-in at grassroots level, with people in each parish taking people in. leader Lucinda Creighton says she is to go directly to An Garda Siochana over the disposal of personal papers and disappearance of a SIM card belonging to former Garda Commissioner Martin Callinan. The Dublin Bay South TD today expressed deep concern over the Fennelly report finding that potentially valuable information was not made available to the Commission. And she said she intends to directly contact Garda Commissioner Noirin O’Sullivan, Mr Callinan’s success, to call for a full probe. I don’t know the facts or circumstances here, all I’m aware of are very very serious allegations and if they are true then I think it absolutely merits a full investigation,” Ms Creighton said. She made the remarks ahead of the party’s think-in in Dublin this morning. In his report, Mr Fennelly said it has been striking how little documentary evidence was available to his team. Mr Callinan told the Commission that he had cleared out all personal papers after he announced his retirement and he did not have any written notes to support his evidence. He was, however, able to produce his diary for the year 2014. On March 25, Mr Callinan went to a filing unit in the Conference Room, where he kept personal papers, and requested black refuse sacks as he wished to sort through his files. He later asked a Superintendent to dispose of 8 to 10 bags of personal papers, which were shredded on April 4th, 2014. 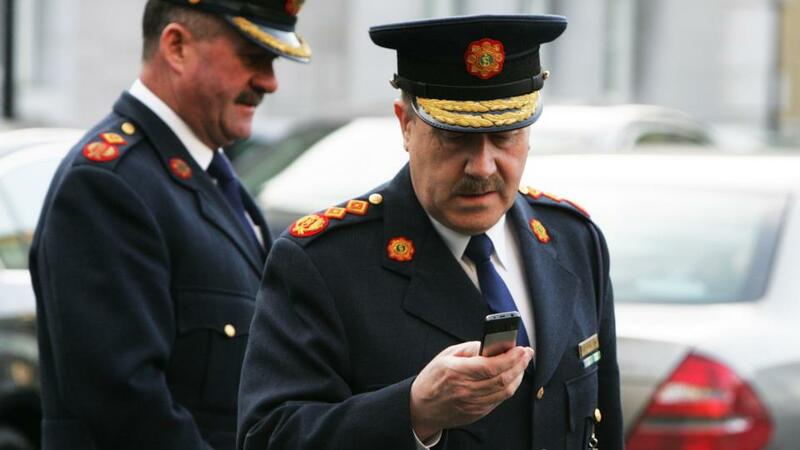 The report also details how the SIM card in Commissioner Callinan’s phone was removed and subsequently destroyed. The Commission again wrote to Mr Callinan and asked him to search for the phone. He found it and furnished it to the Commission but it had no SIM card in it and no information stored on it. An Assistant Commissioner said that the phone had been returned to the force by Mr Callinan – but that the SIM card had been removed. 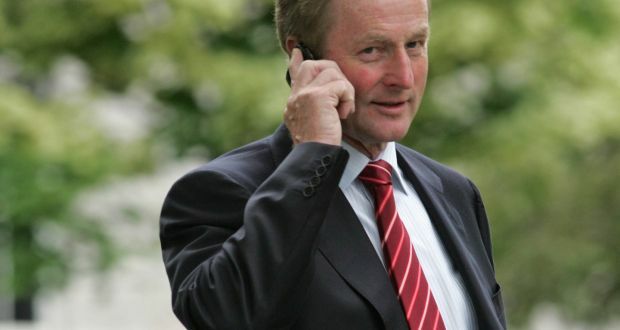 The issue of the shredded papers and missing SIM are among the factors that prompted calls to recall the Dáil next week to discuss the Fennelly report. (Right pic.) 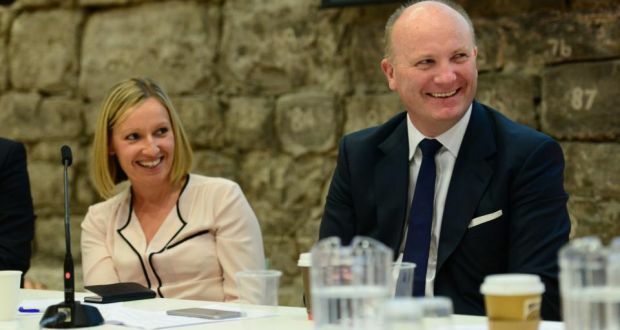 Lucinda Creighton and Declan Ganley at a Renua Ireland think-in in Wood Quay, Dublin. Renua Ireland is working on a radical new policy that would see the introduction of a flat tax on all income, with bands and most allowances being scrapped. 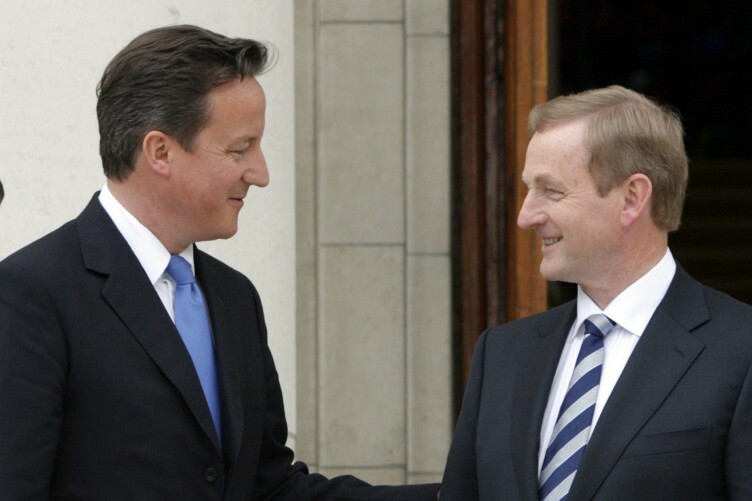 The disclosure was made during the party’s first think-in in Dublin, during a session on the economy. Businessman Declan Ganley, who was a guest speaker, told delegates that a flat tax regime was a “great disrupter” and would create a huge buzz that would attract international business and finance to Ireland. “It’s going to be controversial. You can welcome the debate. It’s going to create a long-term sustainable economy,” he said. A flat rate is a system of taxation where one tax rate is applied from the smallest incomes, including social welfare, to the largest. There are variations on the idea, including the concept of a negative income tax, put forward by Milton Friedman in his 1962 book Capitalism and Freedom. A negative income tax would allow personal deductions, or a threshold, before the flat tax was applied. If the person’s income did not reach that threshold, they would be paid a negative tax calculated on the amount of the shortfall. This would replace some welfare payments. Renua chairman Eddie Hobbs disclosed that Mr Ganley’s idea had already been taken up by the party and work on a policy was at an advanced stage. It is thought that Renua does not favour a true flat tax, but one that would include deductions and balancing measures to protect vulnerable families and individuals. Mr Ganley urged the party not to shy away from big ideas. “Do the stuff that vested interests will resist and they will hit you hard, but you can take them head on,” he said. Mr Ganley also attacked what he described as crony corporatism in Ireland. He said there was a perception that there was a very small circle of individuals who have unique access to the halls of power and have the ability to capture part of this economy and make it available for self-enrichment. In a thinly-veiled reference to businessman Denis O’Brien, he told the meeting there should be no room for those who ignore the findings of a tribunal, or allow Dáil Éireann to be browbeaten because it does not suit their political or business agenda. Lucinda Creighton told the think-in that people needed to be honest about tax. She pointed to the 1,200 per cent increase that occurred in the capital gains tax take in the five years after 1997, when the rate was reduced from 40 per cent to 20 per cent. Ms Creighton also said she will ask Garda Commissioner Noirín O’Sullivan to assess whether an investigation is needed into the destruction of documents by former commissioner Martin Callinan. The interim report of the Fennelly Commission, which investigated Mr Callinan’s resignation, found that the former commissioner had documents destroyed as he left his post. The commission also found that a SIM card belonging to Mr Callinan could not be recovered. Ms Creighton said she will be making contact with Ms O’Sullivan on the issue. She also said Renua will cut the number of people working in Irish Water as part of an overhaul of the utility company if the party is in government after the next election. She said that her party will restructure and overhaul Irish Water – which she described as “an absolute disaster” – while keeping water charges in place. Patients have been paying up to €500 a month for Fampridine from their own resources. The Health Service Executive has agreed to fund on a limited basis the cost of a drug that helps people with multiple sclerosis to walk. The announcement that Fampridine (known commercially as Fampyra) is to be reimbursed under the State-funded drugs schemes follows a lengthy campaign by patients who says the drug has greatly aided their mobility. The HSE says it is in the final stages of putting in place the arrangement around a “responder-based” reimbursement programme for Fampridine. The cost of the drug will be covered where a demonstration of clinical response, based on objective criteria agreed with clinical experts, is recorded, it says. This clinical response must be shown to persist based on objective measurement at six-monthly intervals. In 2013, the National Centre for Pharmacoeconomics, which rules on the cost-effectiveness of new drugs, found Fampridine would cost nearly €7,000 per patient each year. It said the €20 million annual cost to the State over five years would take money from other areas. The HSE then decided that it could not approve the reimbursement of Fampridine and claimed the manufacturer, Biogen Idec, had failed to demonstrate or provide any formal justification for the prices proposed. Biogen maintained it had offered significant price reductions in the talks. Agreement has now been reached on a reimbursement arrangement. Patients have been paying up to €500 a month for Fampridine from their own resources after Biogen started charging for the drug last year following a free trial period. 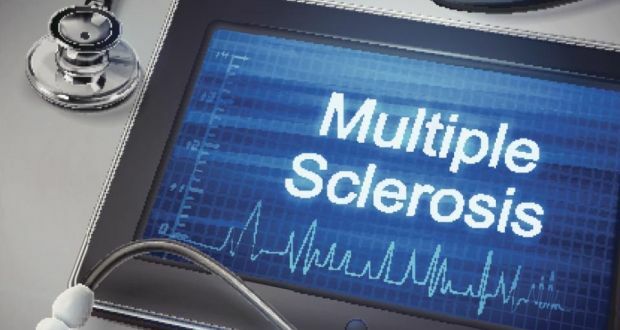 Multiple Sclerosis Ireland expressed delight with the progress on reimbursing Fampridine, which it said had a significant impact on patients’ ability to remain independent. The rise of early animals, not meteorite impacts or volcanic eruptions, led to the world’s first known mass extinction, which took place about 540 million years ago, suggests new research. While mass extinctions are generally associated with catastrophic events, like giant meteorite impacts and super volcanoes, the new study puts the blame on the emergence of complex animals that can change their environment. “People have been slow to recognise that biological organisms can also drive mass extinction,” said Simon Darroch, assistant professor of earth and environmental sciences at Vanderbilt University in Tennessee, US. “But our comparative study of several communities of Ediacarans, the world’s first multicellular organisms, strongly supports the hypothesis that it was the appearance of complex animals capable of altering their environments, which we define as ‘ecosystem engineers,’ that resulted in the Ediacaran’s disappearance,” Darroch said. Researchers believe that earliest life on Earth consisted of microbes – various types of single-celled micro-organisms. They ruled the Earth for more than three billion years. Then multi-cellular organisms like Edicarans emerged and in their heyday,they spread throughout the planet. They were a largely immobile form of marine life shaped like discs and tubes, fronds and quilted mattresses. 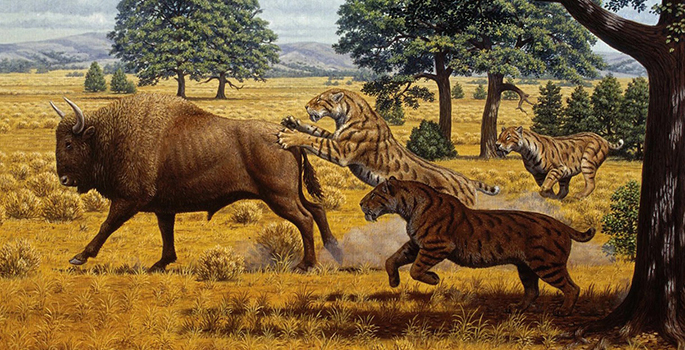 After 60 million years, evolution gave birth to another major innovation: animals. Animals burst onto the scene in a frenzy of diversification that palaeontologists have labelled the Cambrian explosion, a 25-million-year period when most of the modern animal families – vertebrates, molluscs, arthropods, annelids, sponges and jellyfish – came into being. “These new species were ‘ecological engineers’ who changed the environment in ways that made it more and more difficult for the Ediacarans to survive,” Darroch said. The researchers performed an extensive palaeoecological and geochemical analysis of the youngest known Ediacaran community exposed in hillside strata in southern Namibia. The site, called Farm Swartpunt, is believed to be 545 million years old. The researchers believe that as humans are the most powerful ‘ecosystem engineers’ ever known”, an analogy between the Earth’s first mass extinction and what is happening today can be drawn. The Junior Finance Minister says the Government will announce new plans to tackle the mortgage arrears crisis within the next two weeks. Simon Harris claims the measures will specifically target people in long-term arrears. Currently a third of all those who’re behind on their payments are in mortgage arrears of 720 days or more. In the Spring Statement earlier this week, Finance Minister Michael Noonan said, “the Government is actively considering a range of options to strengthen the mortgage arrears framework in order to ensure that families in long term arrears can find a solution. “The Government intends making an announcement on this issue in the coming weeks. A particular focus will be on enhancing the role of the Insolvency Service and the range of solutions that become available through an insolvency arrangement,” he added. The Irish Government is overestimating how quickly Irish emigrants will return home and the boost they will bring to the economy, experts have now warned. 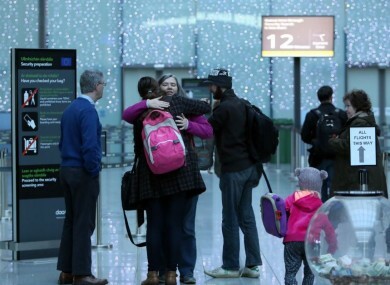 The Government is overestimating how quickly Irish emigrants will return home and the boost they will bring to the economy, experts have warned. Specialists say an influx of emigrant couples, individuals and families over the next couple of years will put increasing pressure on the housing and rental market. Previous homeward migration trends also suggest that returning emigrants will face many psychological challenges upon their return. Dr Mary Gilmartin, who specialises in migration research at Maynooth University and is the author of a new book, Ireland and Migration in the 21st Century, said she is not seeing any pragmatic evidence that the Government is prepared for return migration. Last week, as part of the Government’s Spring Statement, Finance Minister Michael Noonan pledged to lure tens of thousands of emigrants home with more favourable tax measures. A spokeswoman from the Department of Foreign Affairs and Trade said the new proposals are “an important step” in returning to net inward migration by 2017. However, Dr Gilmartin argues a lot more must be done before emigrants living in Australia, New Zealand, Canada and the United States book flights home. “It’s a very patchy recovery. Some areas are doing well, but other areas are still struggling. The upheaval of moving a family is such that I can’t see people engaging in that kind of upheaval to move a family back again quite so quickly,” she said. Last month, as part of his St Patrick’s Day address, Taoiseach Enda Kenny said 2016 will be the year where the number of our people coming home “will be greater than the number of people who leave”. However, Dr Ralph, who did extensive research on Irish returning from the US during the Celtic Tiger, contests this prediction. “Will there be a rush? I don’t think so, I don’t think the economy is necessarily buoyant enough to create the return seen during the boom years,” he said. Dr Ralph also anticipates problems with welfare entitlements as access to certain social assistance payments, including Jobseeker’s Allowance, partly depends on length and purpose of any absence from Ireland. He believes slower, organised return is more sustainable. “If we have a housing crisis in Dublin as it stands and up to 50,000 Irish people return, then we are going to have an even bigger housing crisis because they will move to urban areas,” he said, adding that part of the over-heating of the economy from 1996 to 2006 was due to the rush of return migrants. A close-up of the ANPR system in traffic corps vehicles. Hundreds of thousands of drivers have been wrongly identified as having failed to pay their car insurance – forcing Gardaí to suspend the use of one of their key IT systems. The computer network was acquired by the gardai for about €6m and is part of the Automatic Number Plate Recognition, or ANPR, system. But database errors led to the incorrect designation of the drivers involved. 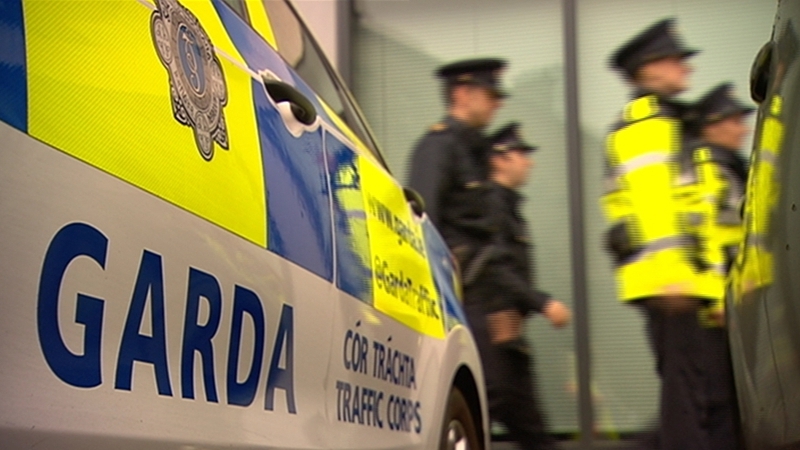 Difficulties were highlighted in a meeting between officials at the Departments of Transport and Justice and Gardai. A handwritten note, which was recorded by a senior official in the Department of Transport, appears to blame motor insurance companies for failing to update the database properly. It is unclear how many drivers were monitored by garda patrols as a result of the incorrect data information. It is also not known for what length of time the database was suspended, or what was the financial cost of the error for the various parties involved. Garda HQ replied to a series of questions submitted by RTÉ’s ‘This Week’ programme, which obtained the note. “An Garda Siochana is aware of an issue in relation to certain insurance related data on the ANPR system. We are working with all the partner stakeholders to resolve the issue,” it said. The latest figures from the Central Statistics Office show there are about 2.4 million licensed vehicles in the State. This meant the number of hits for non-payment of insurance on the garda IT system was almost half the entire number of vehicles on Irish roads. Insurance industry studies suggest the number of uninsured vehicles is around 6pc of the total number, which would mean that around 900,000 of those hits for non-payment were false. The body which represents motor insurers said it had no comment to make. ANPR systems are generally considered to be valuable enforcement tools when managed correctly. The police investigation into the disappearance of toddler Madeleine McCann is gathering pace after the discovery of further information. It was eight years ago today that Madeleine vanished from her holiday apartment in Portugal. No trace of the toddler has ever been found, despite an intensive police hunt and campaign by her parents. Detectives had previously been probing 18 burglaries at tourist apartments in Praia da Luz which matched the circumstances by which they believe Madeleine was taken. 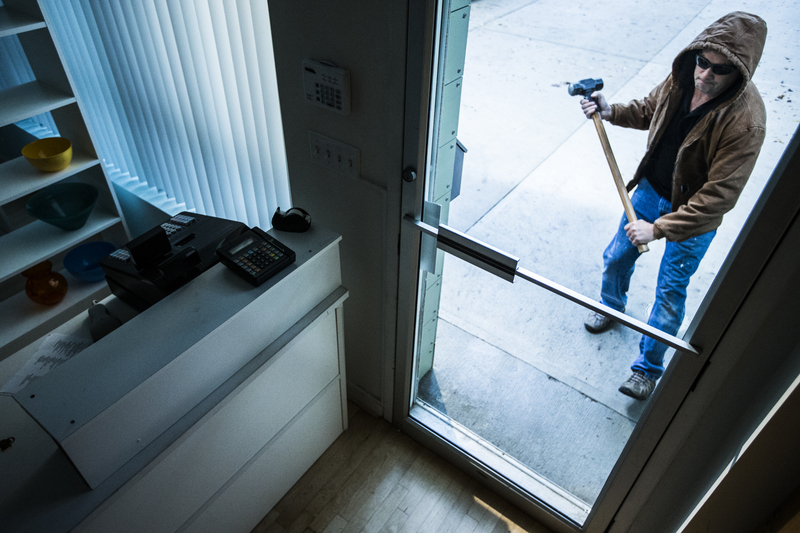 These burglaries had seen the thief gain entry to the premises via a window. However after intensive police investigation in the case, a further ten apartments have now been included in the investigation. Forensic evidence from these apartments is now being compared to evidence from the apartment Madeleine was staying in. The development was revealed in new book ‘Looking for Madeleine’. Last week her parents won a libel payout against Portuguese detective Goncalo Amaral. He had been on trial over claims he made in a book that the couple were involved in Madeleine’s disappearance. 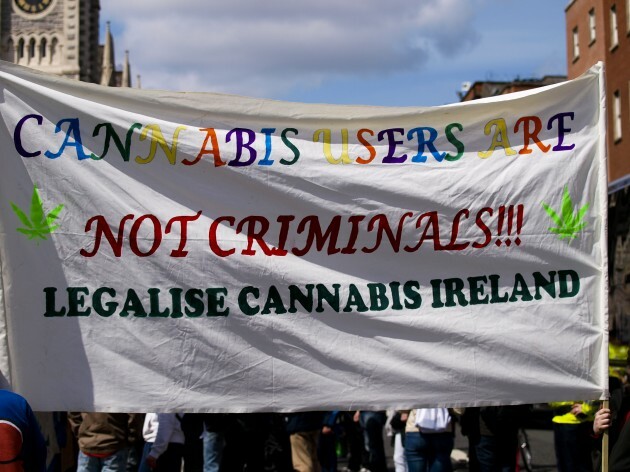 The National Organisation for Reform of Marijuana Laws (NORML) is holding a demonstration in Dublin this afternoon calling for the drug to be decriminalised. The group said it would benefit to the Irish economy if cannabis were legalised and sold through reputable outlets. The rally started in the Garden of Remembrance in Parnell Square and is making its way towards Leinster House. 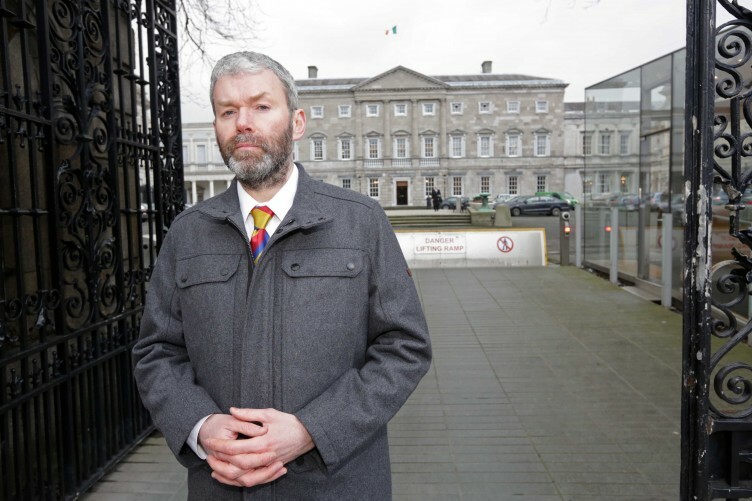 Director of NORML Ciarán Maher said: “The issue of cannabis in our society isn’t one that’s going to go away. It’s the third highest used drug in the country after alcohol and tobacco. New research shows the decline of some of the world’s largest herbivores like Rhino’s could lead to “empty landscapes” in our most diverse ecosystems. New research shows the decline of some of the world’s largest herbivores could lead to “empty landscapes” in our most diverse ecosystems. The recent analysis focused on 74 large herbivore species, especially those from Africa and Asia, Oregon State University reported. 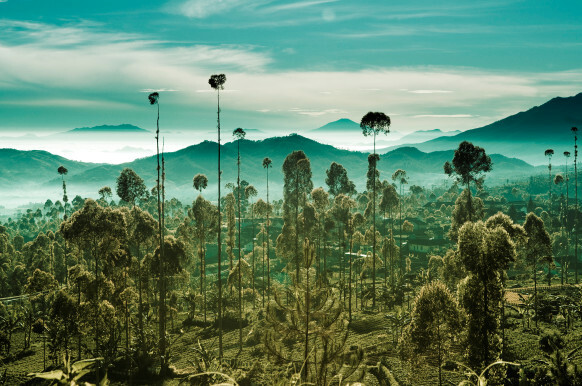 Kent H. Redford, then a post-doctoral researcher at the University of Florida, first used the term “empty forest,” which suggested that while fauna may appear plentiful, its loss imposed a long-term threat to ecosystems. The findings showed 25 of the largest wild herbivores now occupy only about 19 percent of their historical ranges. This is primarily due to competition from livestock production, which has tripled globally since 1980 and reduced the amount of accessible land. Hunting is also believed to play a significant role in the species’ decline. 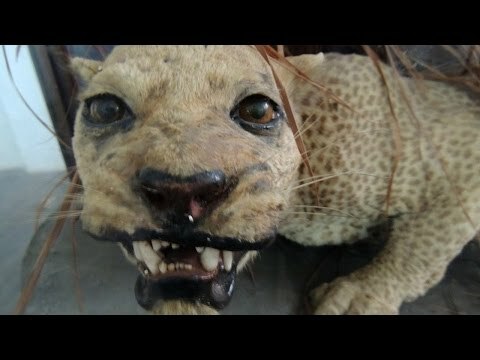 The effects of this devastating species decline is predicted to include a reduction in food sources for large carnivores, diminished seed dispersal for plants, more severe and frequent wildfires, slower soil nutrient cycling, and habitat changes for smaller animals.